Both small bags side by side. 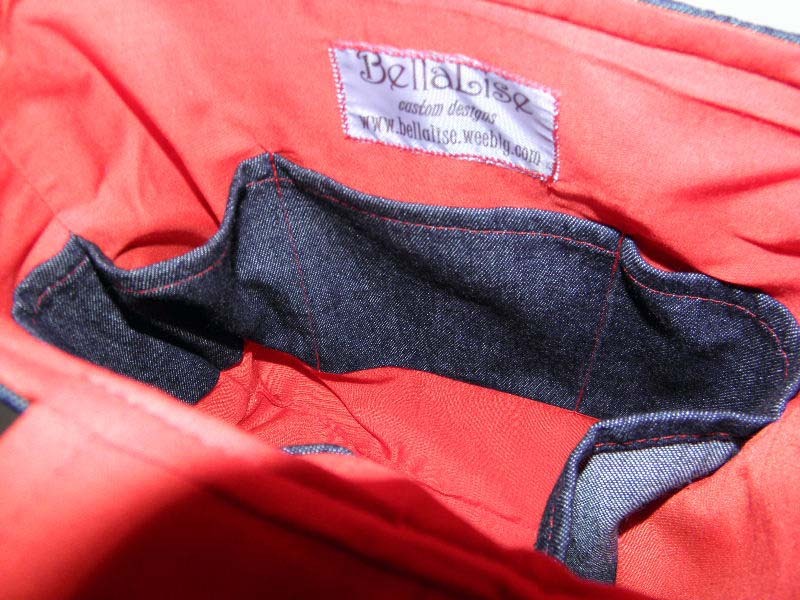 Inside is red cotton with six denim pockets. Who doesn't love a little modern cuteness? 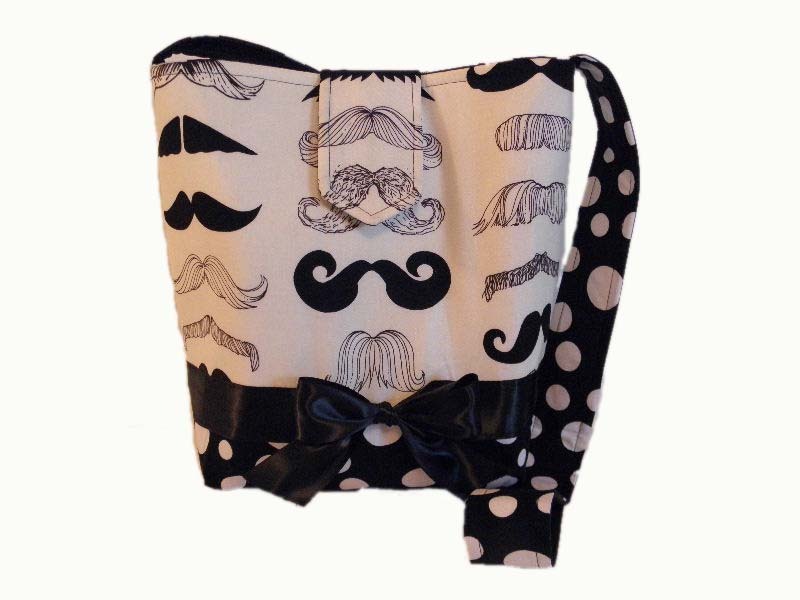 You will get lots of compliments on this hilarious mustache bag! 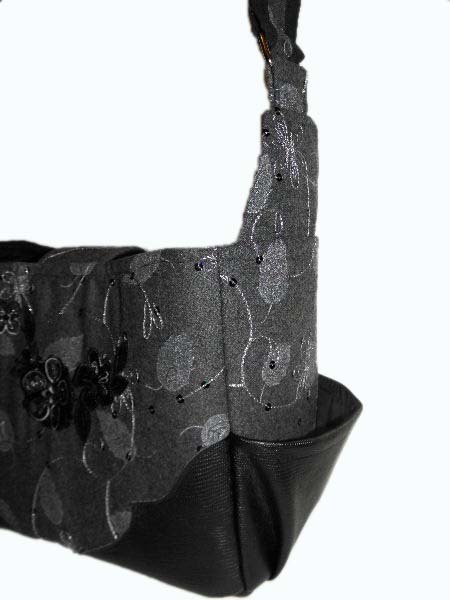 Has a pretty, satin bow tied on the front, and 6 inner pockets. Available in my Etsy store. 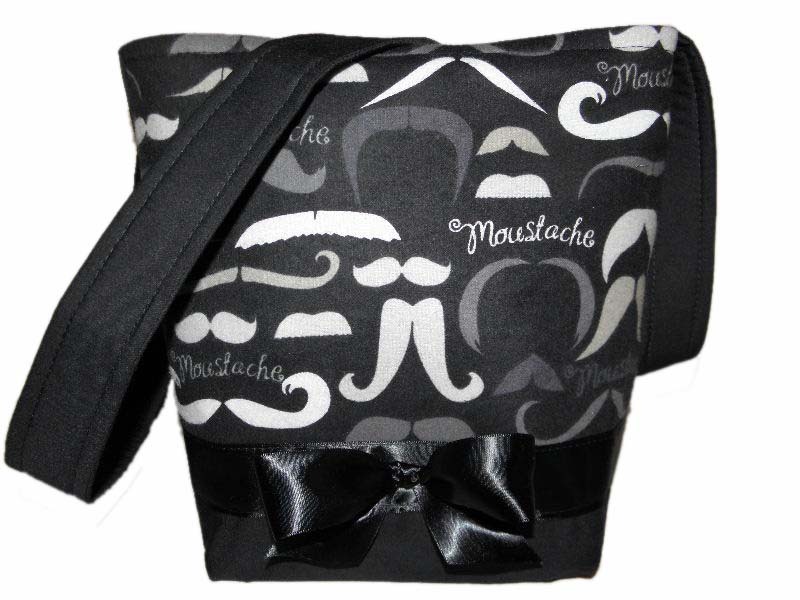 A second version of the mustache purse in black and grey tones. Available in my Etsy store. Five pockets inside, two large, three small. A medium size bag inspired by the Harry Potter movies. 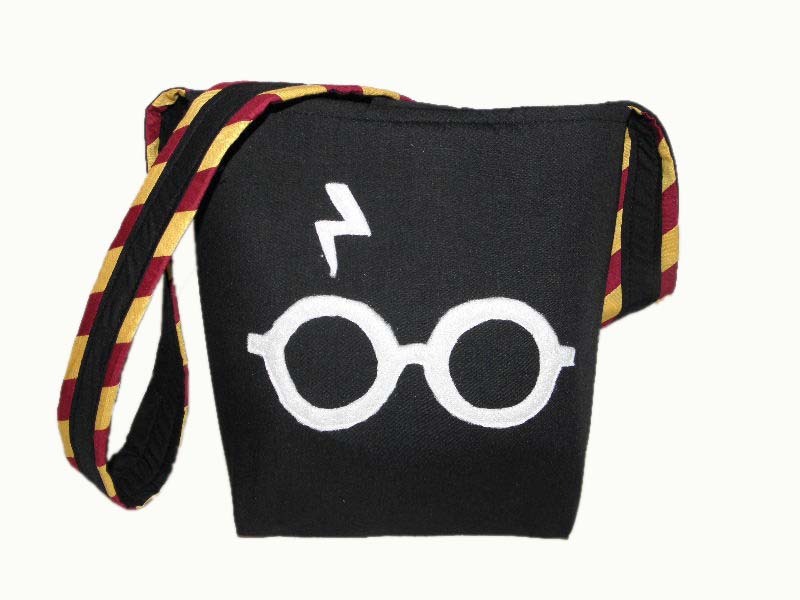 This adorable bag has the glasses and lightning bolt from The Boy Who Lived, and the Gryffindor colors adorn the single strap. 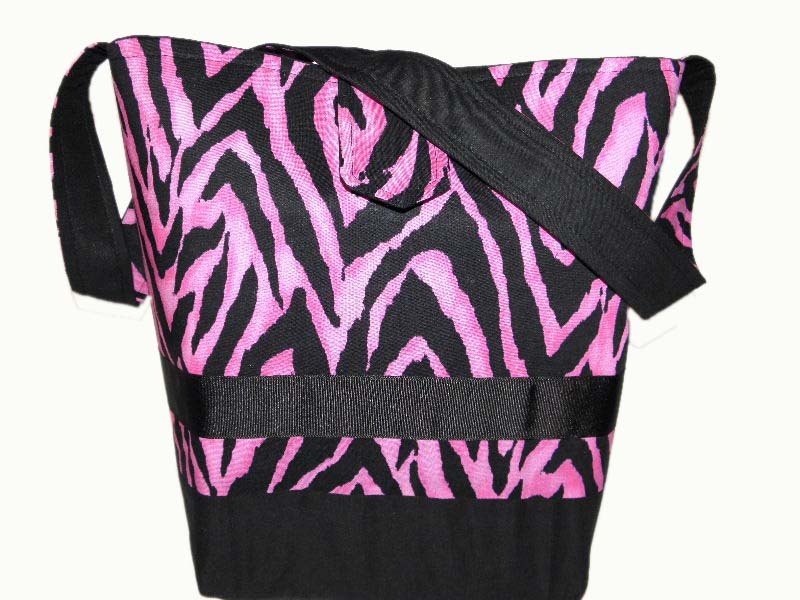 This bag can be worn over the shoulder or across the body. Bag measures 13" x 11" x 4". Available in my Etsy store. 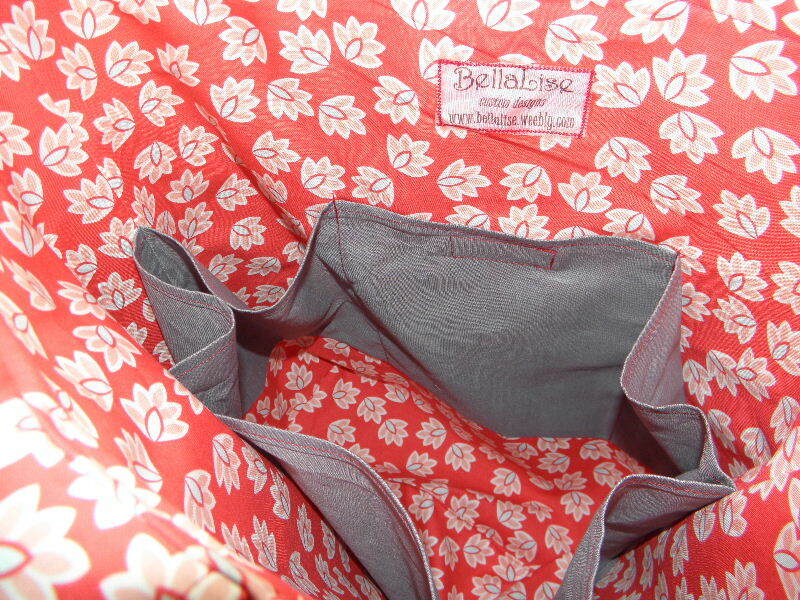 Inside has six pockets to store all your smaller items. 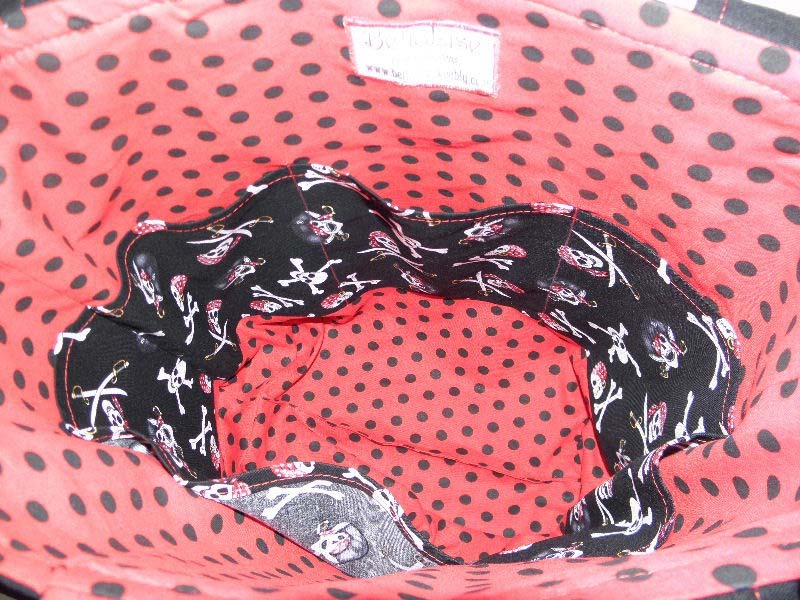 Top has a hook and loop closure. 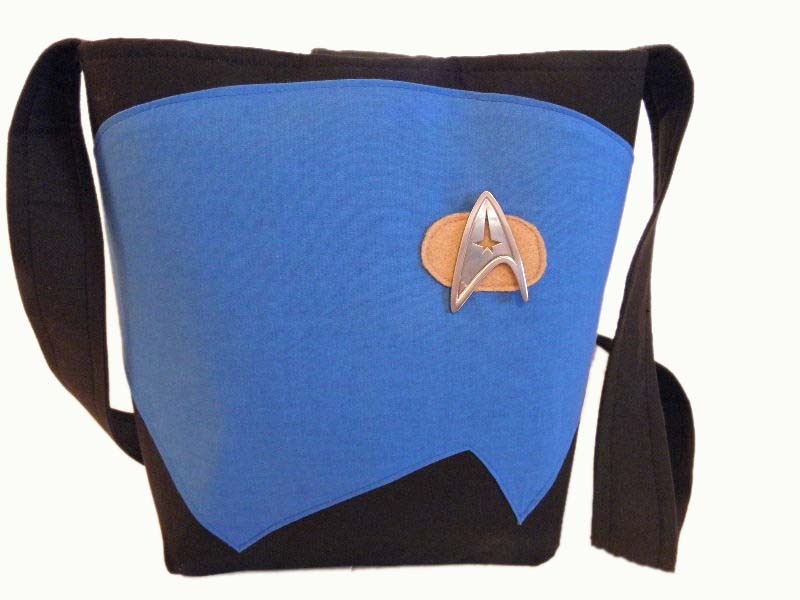 Star Trek medium bag (this one has a Command pin attached). 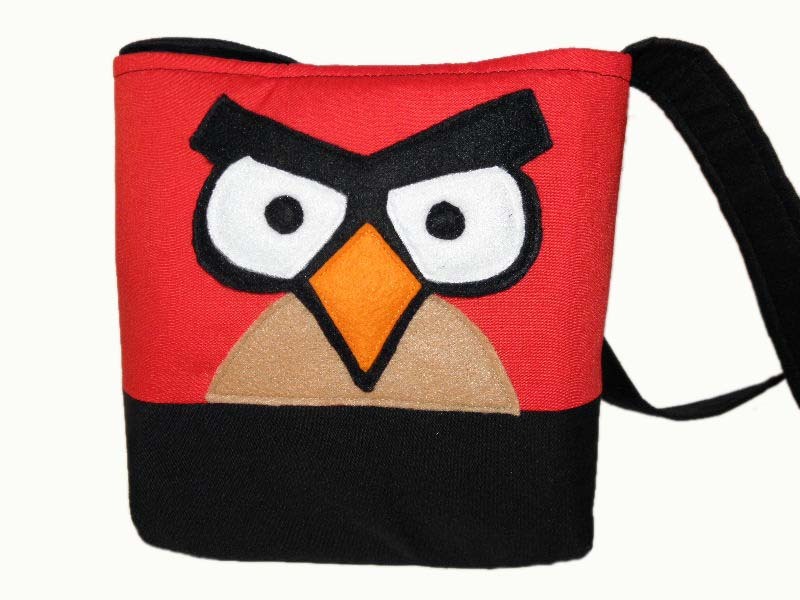 Has single messenger strap, and a hook and loop closure. Available in my Etsy store. 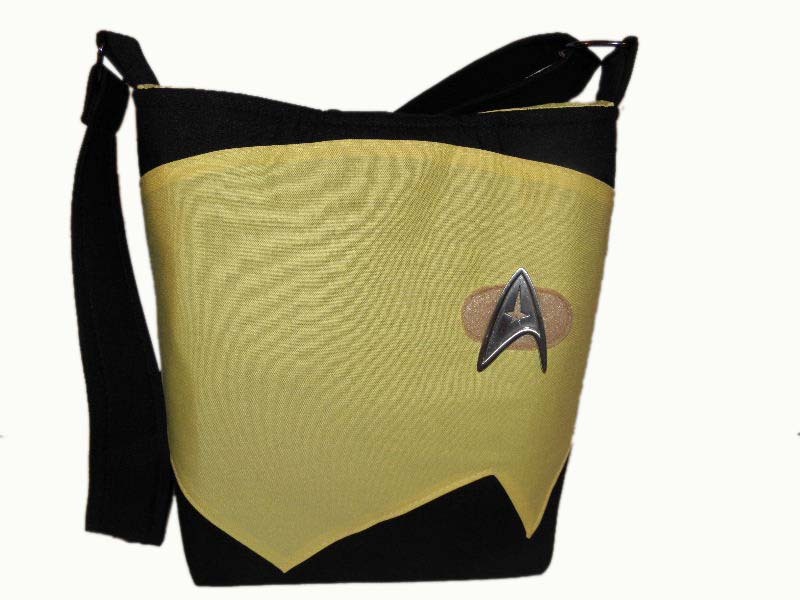 Star Trek medium bag (this one has a Command pin attached). 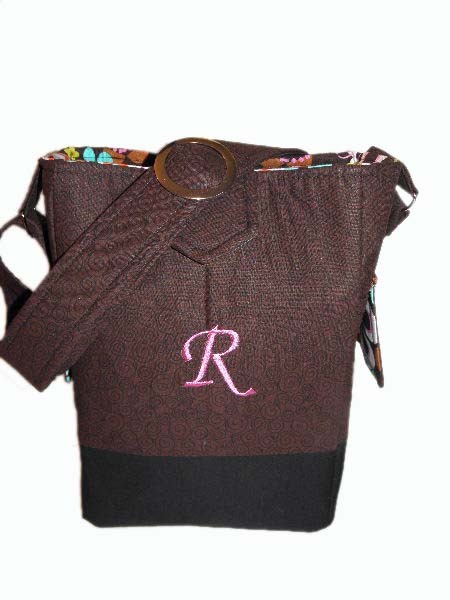 Has single messenger strap with an adjustable slider (add $3), and a hook and loop closure. Available in my Etsy store. Star Trek pin choices: Command, Medical, Sciences, and Engineering. Please specify choice when ordering. 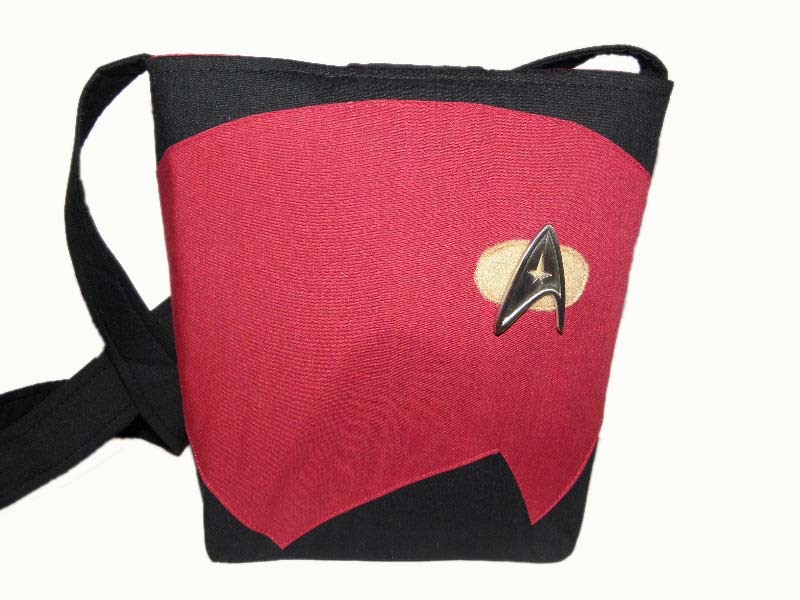 Photo courtesy of Thinkgeek.com. 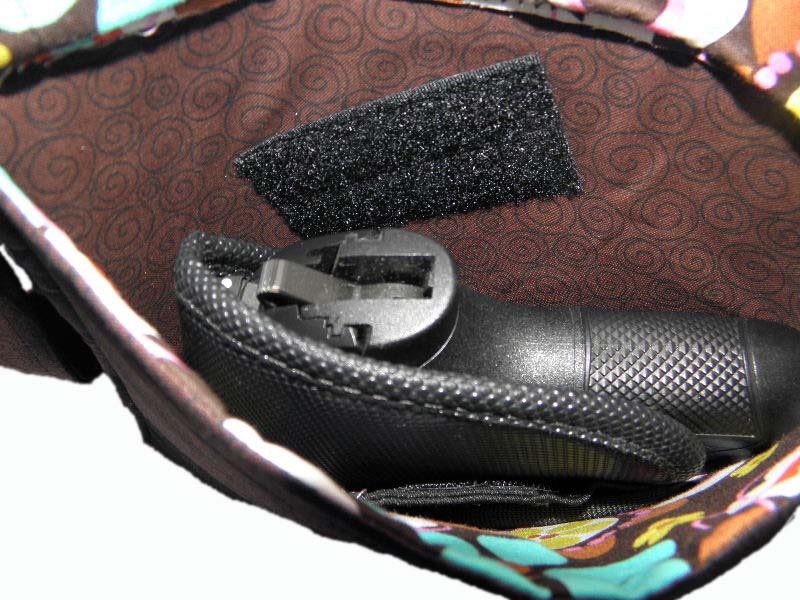 Medium size concealed carry handbag. This is worn across the body to ensure maximum security of your firearm when wearing it on your body isn't an option. Back side worn against your body contains the concealed carry pocket. Magnetic closure is great for quiet access to your firearm. 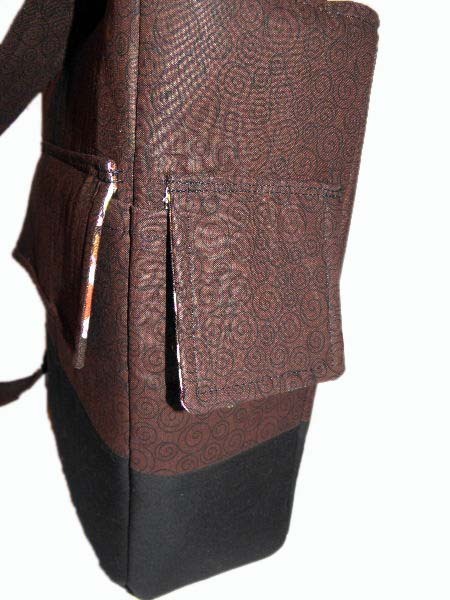 Outer side pockets, great for your keys, phone, or extra magazines. 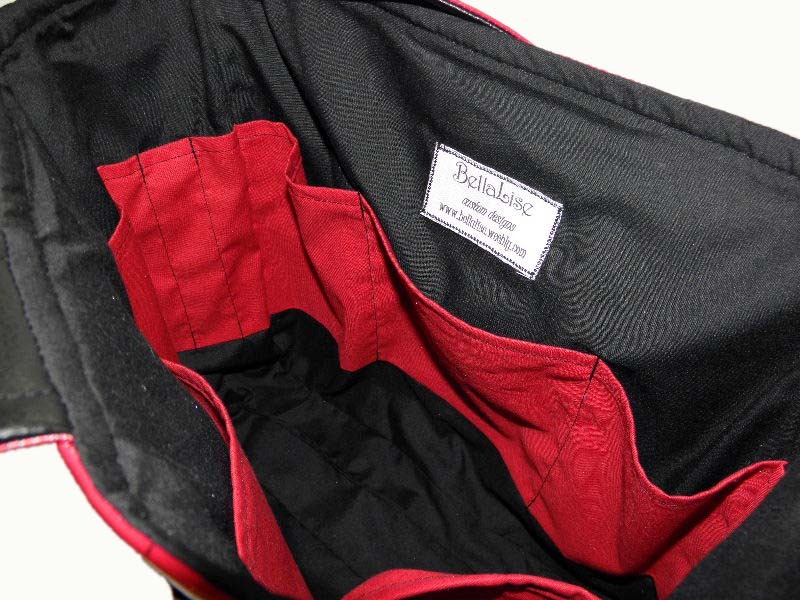 Back pocket has an elastic strap that can Velcro through your holster clip, or around your holster. This positions your firearm in the grip up position for easy draw, and keeps the firearm pointed in a safe direction. Leave unattached for a Remora holster or a larger firearm that doesn't need to be secured in place. Inside lining and pocket for more storage inside the bag. 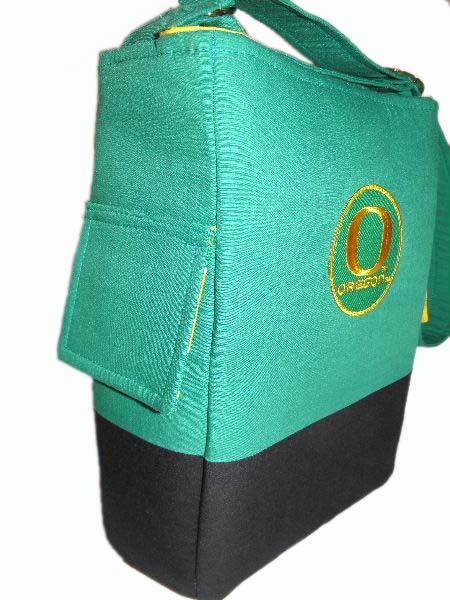 Concealed carry medium bag in University of Oregon green and black. 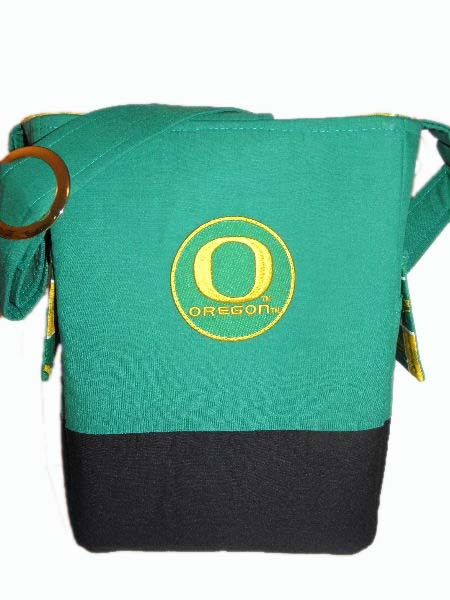 This bag has a U of O patch on the front, and a gold slider adjustable strap. Available in my Etsy store. 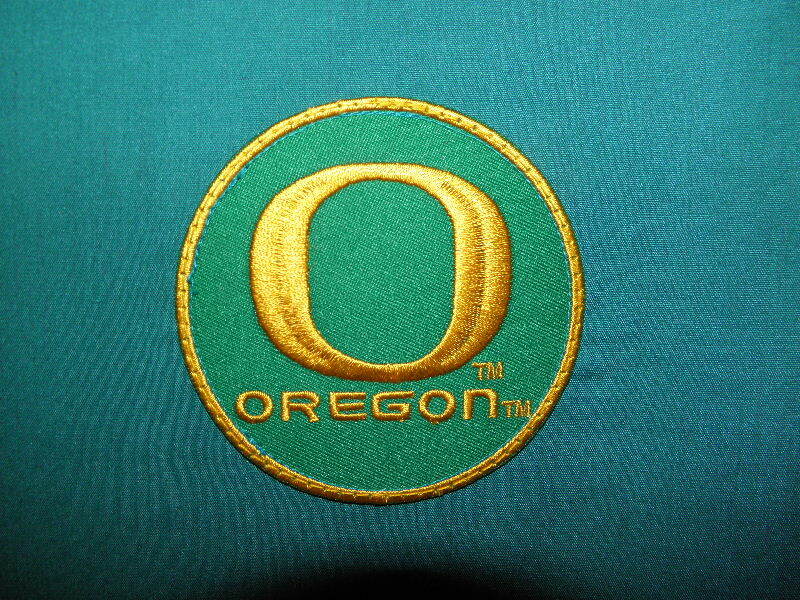 University of Oregon patch on the front. Pockets on the sides, lined in U of O fabric. Concealed carry pocket on the back, close to the body. If you can't carry ON you, this is the next best way to make sure your firearm is secure. Use the messenger strap across the body to make it more secure. 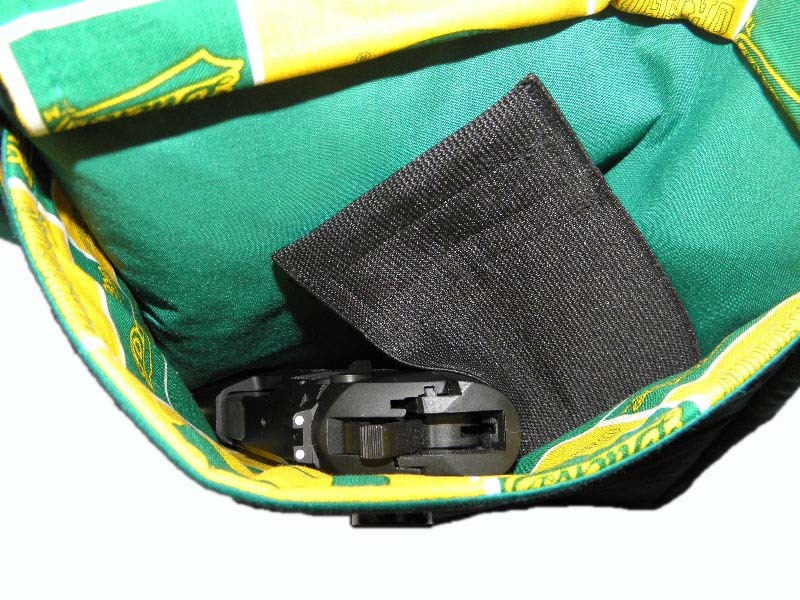 Pocket has an elastic strap that can fasten around the holster, or through the clip on the back of the holster. That way, you have easy, quick access to your firearm. Pocket fastens with a quiet, magnetic snap. 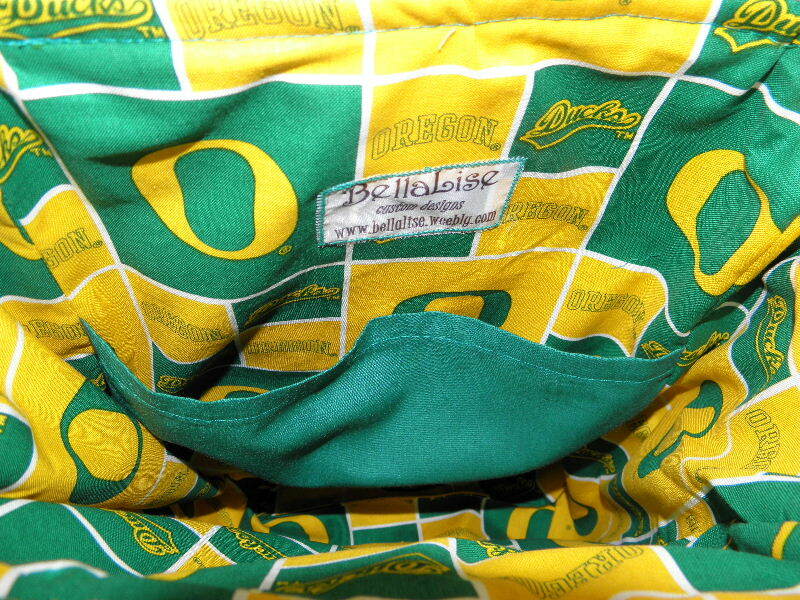 Inside is lined with U of O fabric, and has a back pocket. 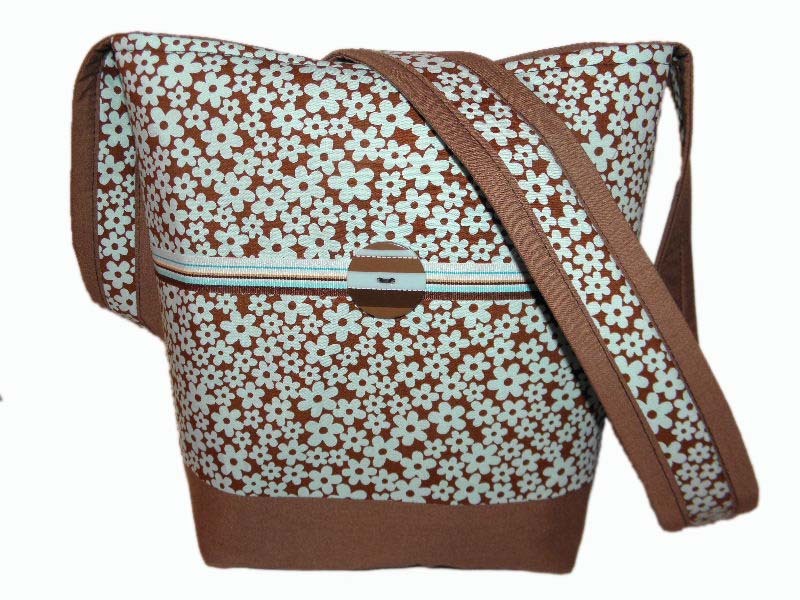 A gorgeous medium handbag in blue and brown. 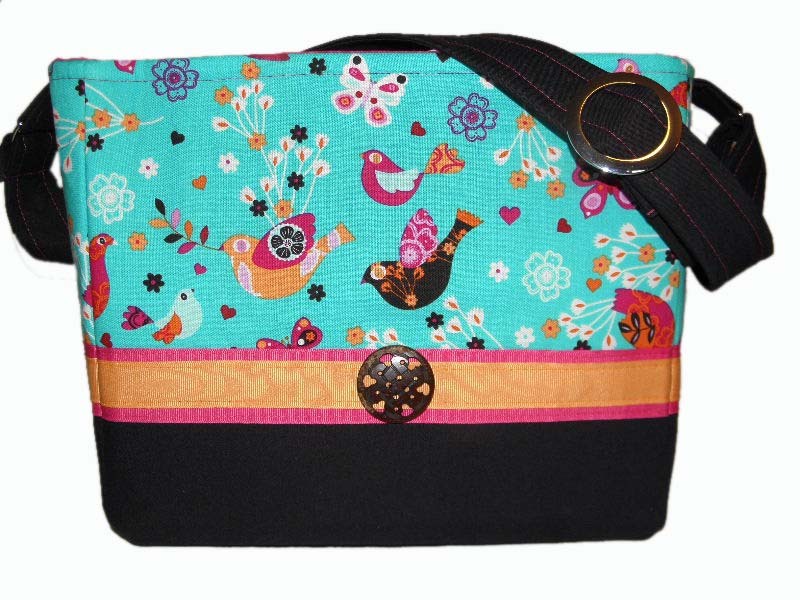 This purse has a long, messenger strap and a hook and loop closure. Six pockets inside for lots of storage. A special order purse. 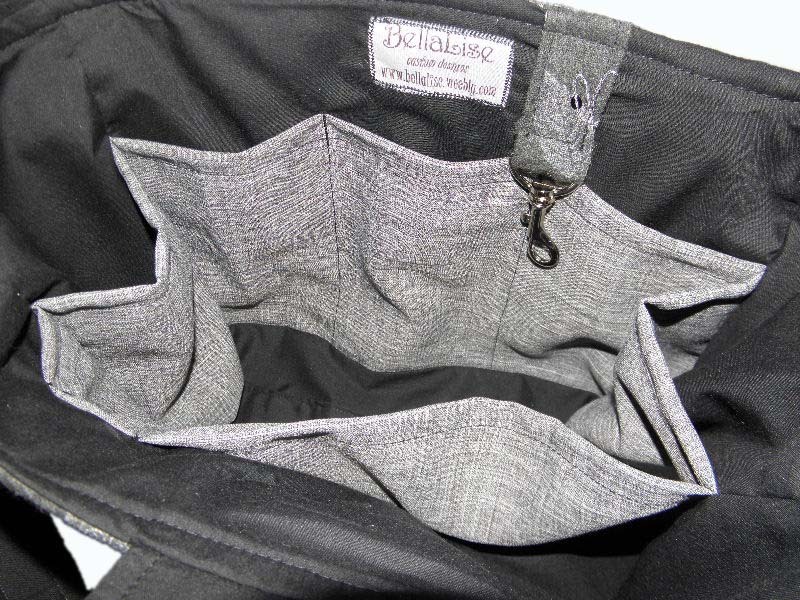 While I might not be able to find this exact same grey fabric, I can usually find one that's similar. Bottom and sides are black alligator vinyl. Front applique is sewn in place. Looks great with the grey and black! 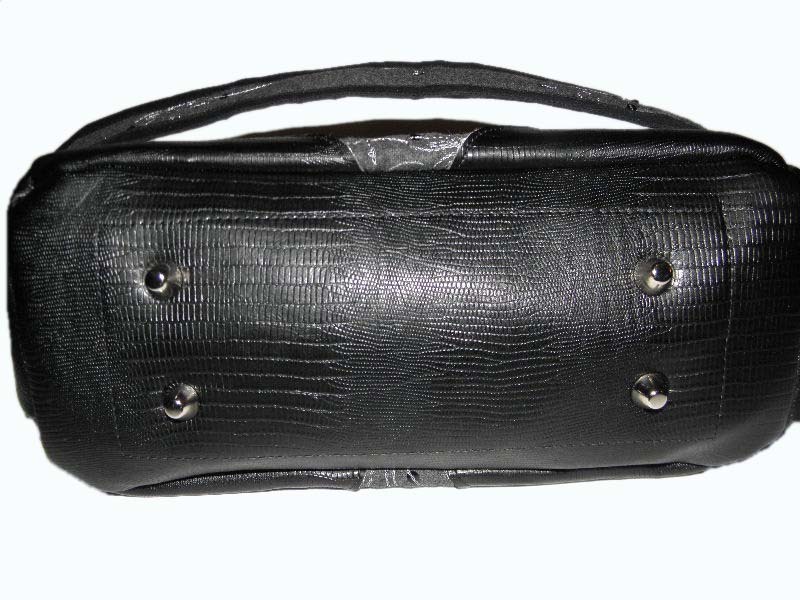 Side pockets are alligator with a black cotton lining. Has a single messenger strap. She wanted a lipstick pocket inside the other side pocket. Back side has a long single pocket. For the inner pockets, I left one pocket larger for her check registers, which are next to two pen pockets. Also put in a keychain clasp to easily locate keys at any time. Bottom is black alligator with silver purse feet. 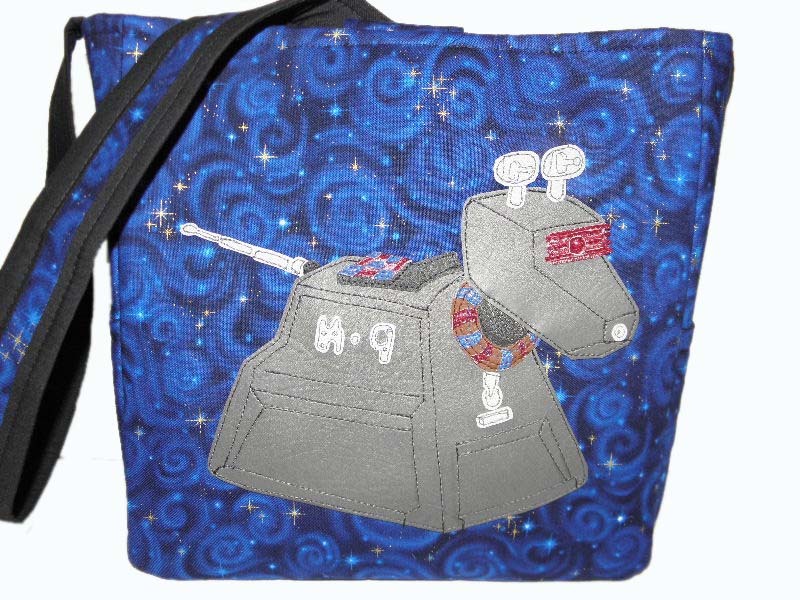 For my Doctor who fans, the new K-9 medium handbag! 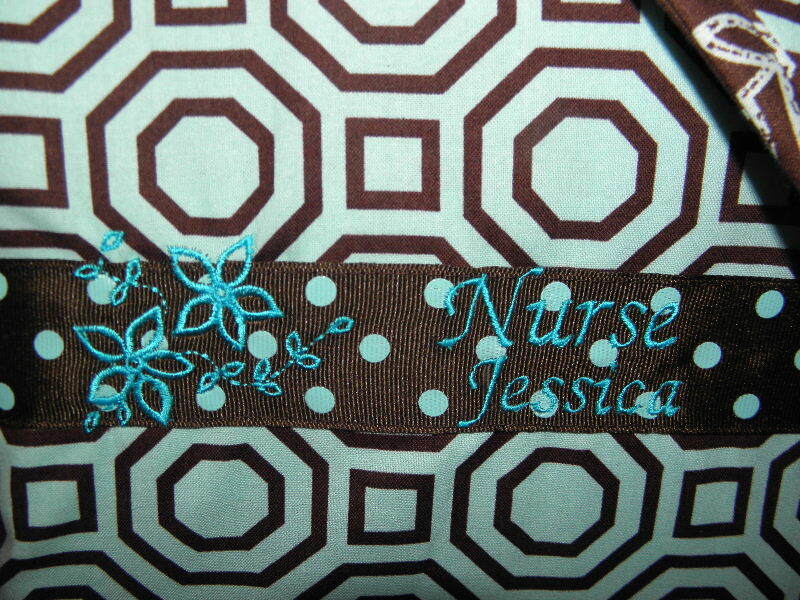 This vinyl applique is hand stitched. Measures 11 1/2" wide x 12" tall x 5" deep. Available in my Etsy store. 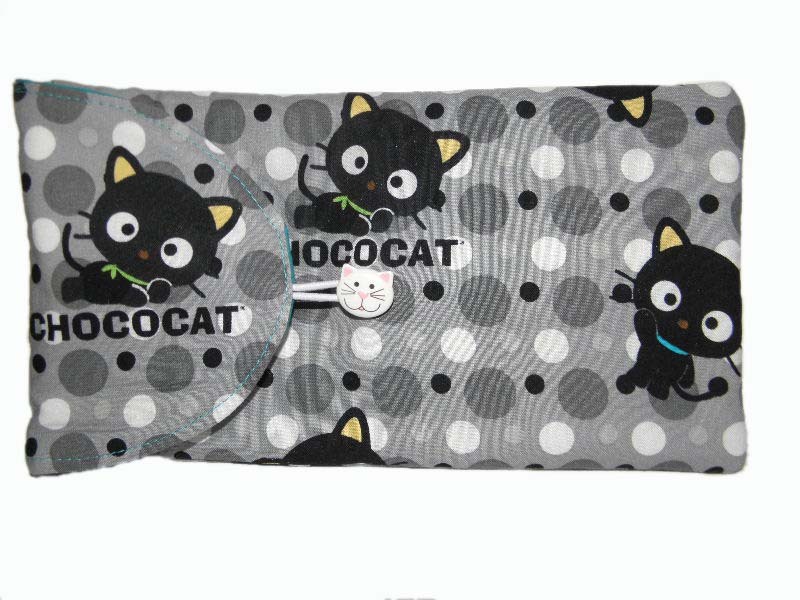 Sides have pockets for small things like a phone, keys, etc. Back has a long single pocket. 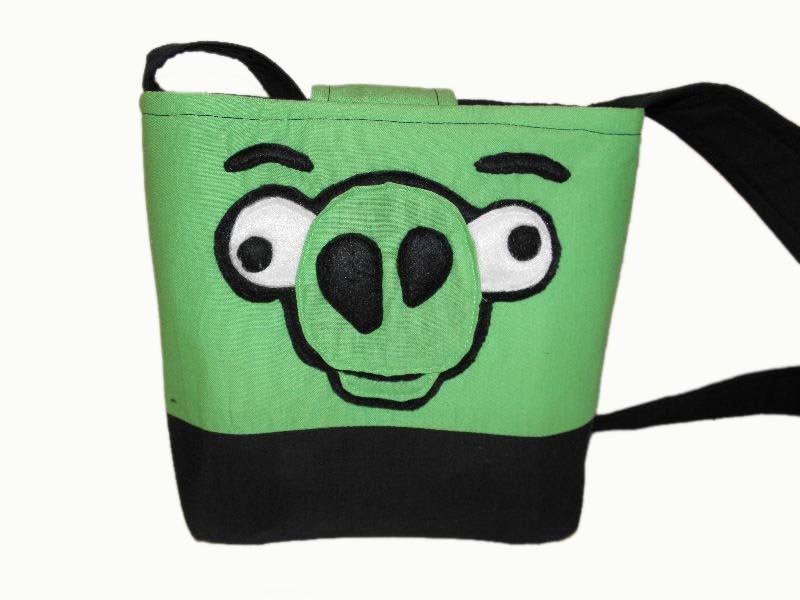 This bag has a single messenger strap (perfect for hands-free at the con! 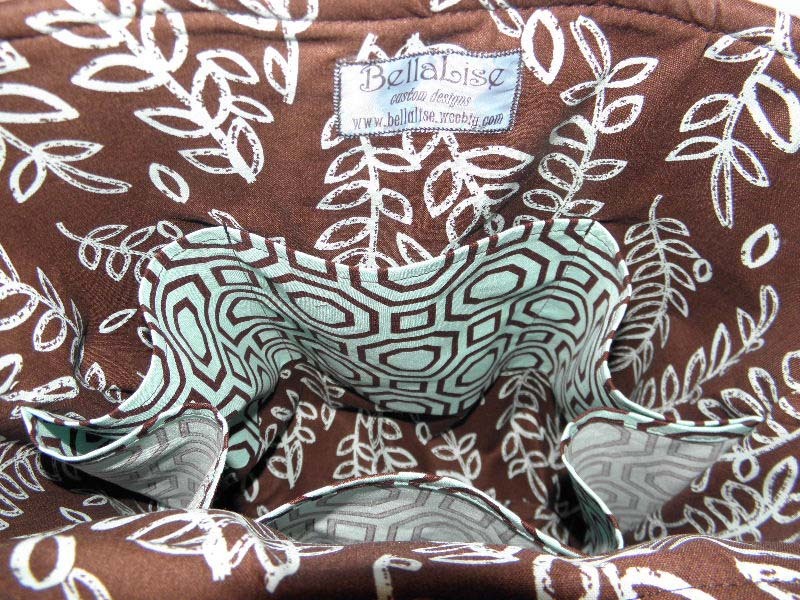 ), and a hook and loop flap closure. 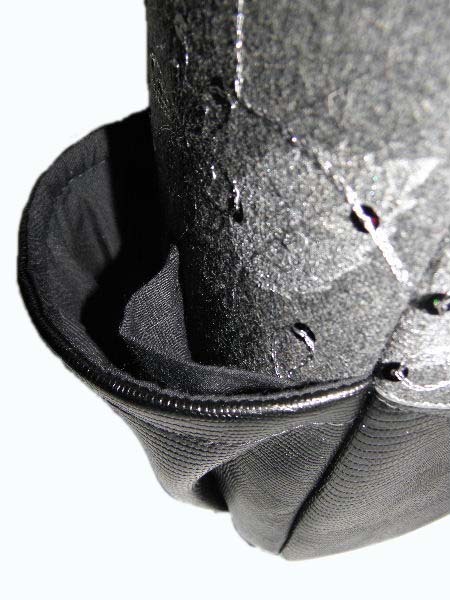 Inside lining of the pockets is black cotton. 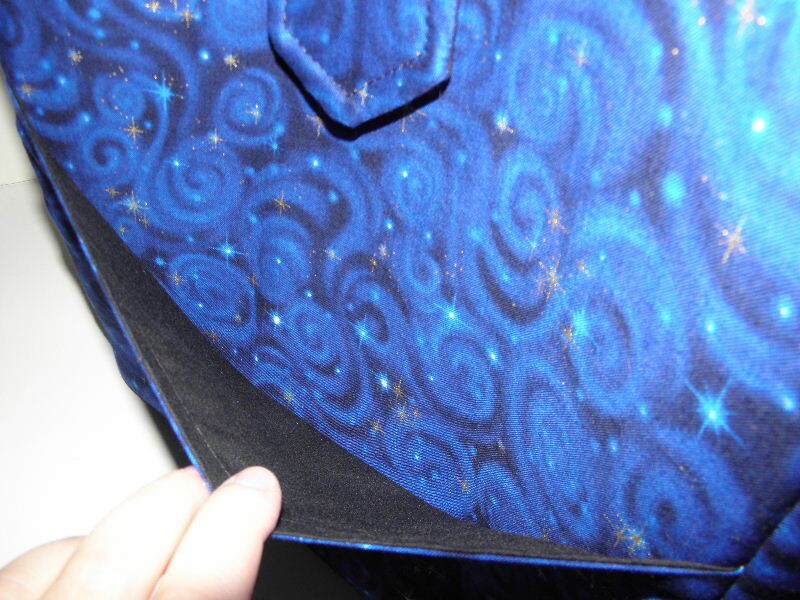 Inside lining is black cotton with Tardis blue swirl pockets. Eight pockets total. 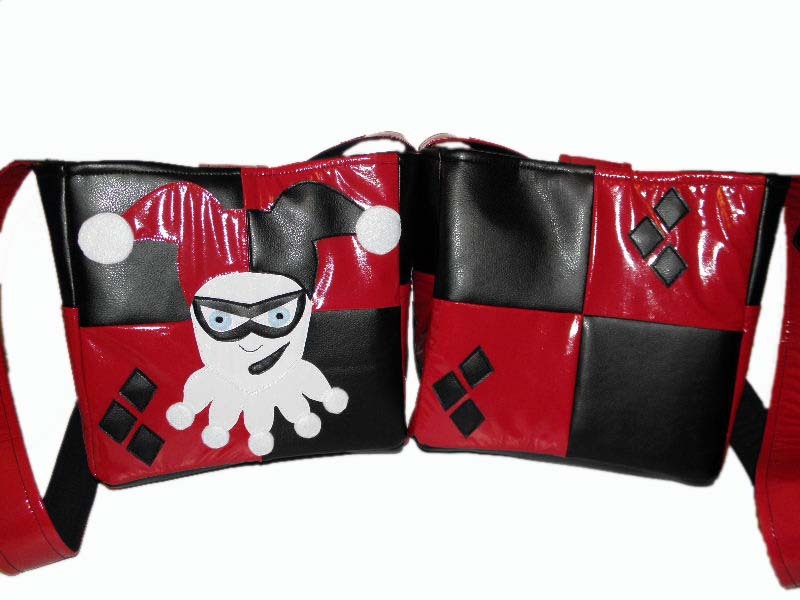 Front view of both Queen of Bag vinyl purses. 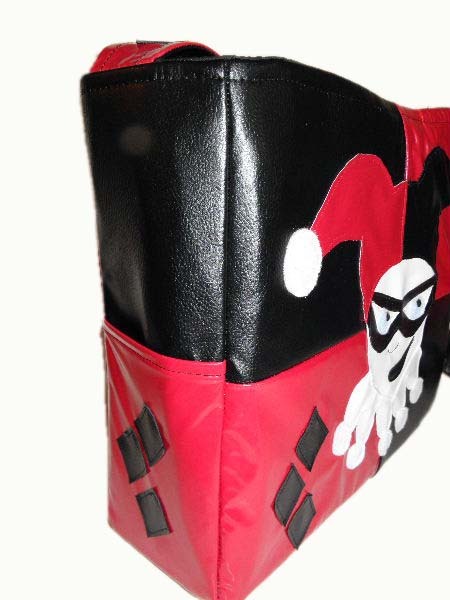 Left side features the face of Harley Quinn. Right side is the minimalist version of the same. Each is identical on the back and inside. See photos below. Available in my Etsy store. 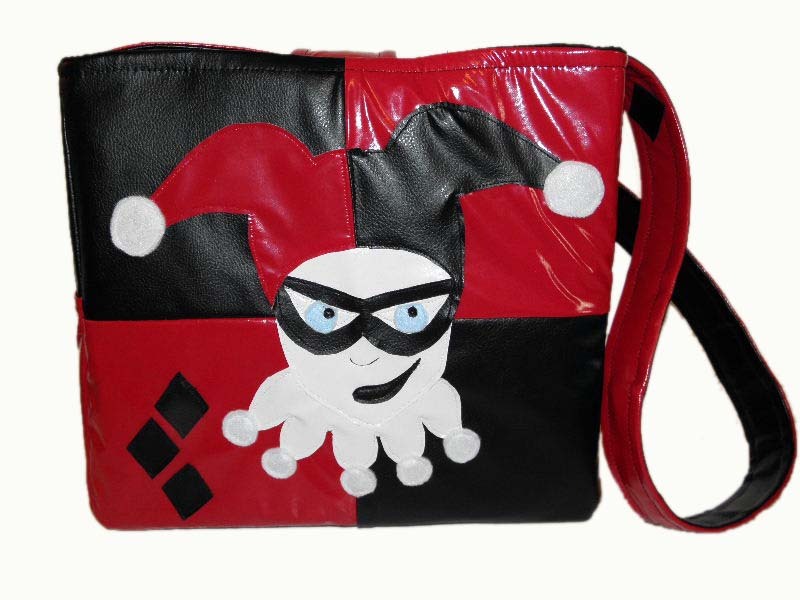 My newest creation, Harley Quinn, makes her appearance on this geeky handbag. 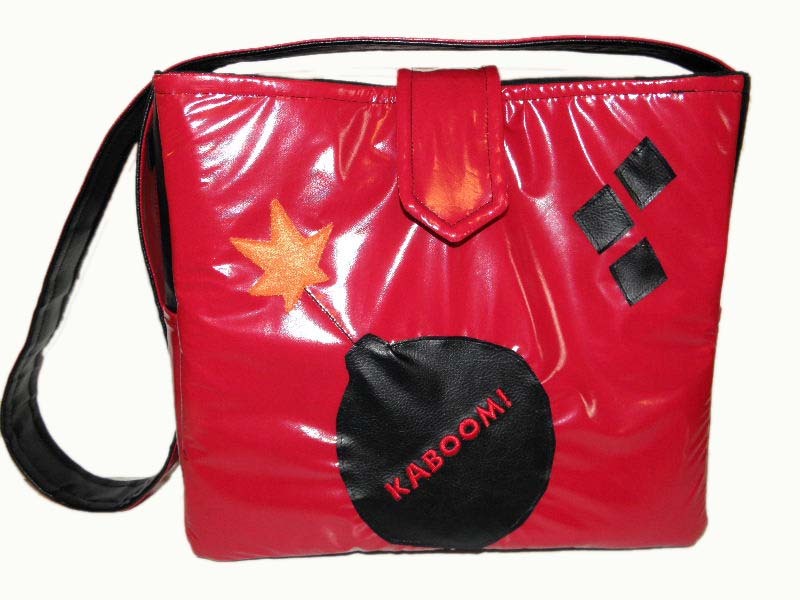 Made of vinyl on the outside, with some felt pieces, and has a messenger length single strap. Measures 12" wide x 11" tall x 4" deep. Sides have a small outer pocket. Back has a bomb that reads "KABOOM!" Coordinating diamonds on the upper right corner. 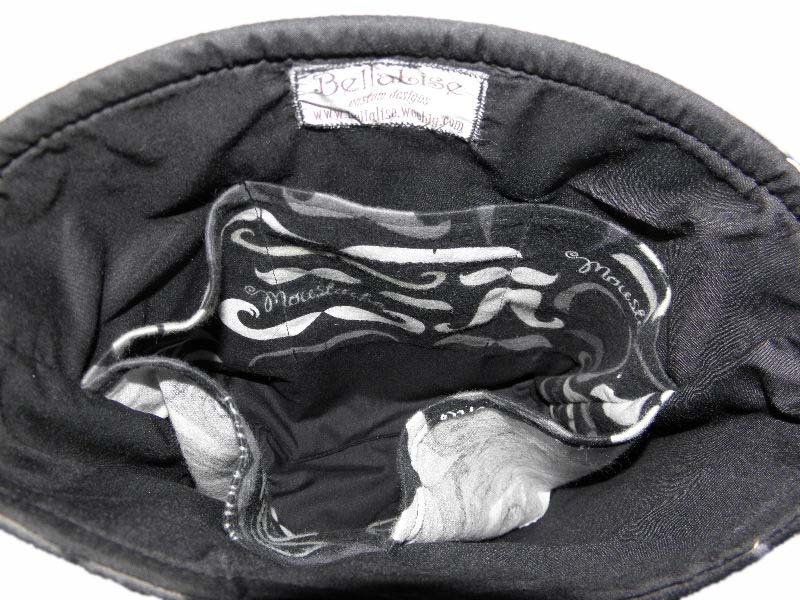 Has a hook and loop back closure. 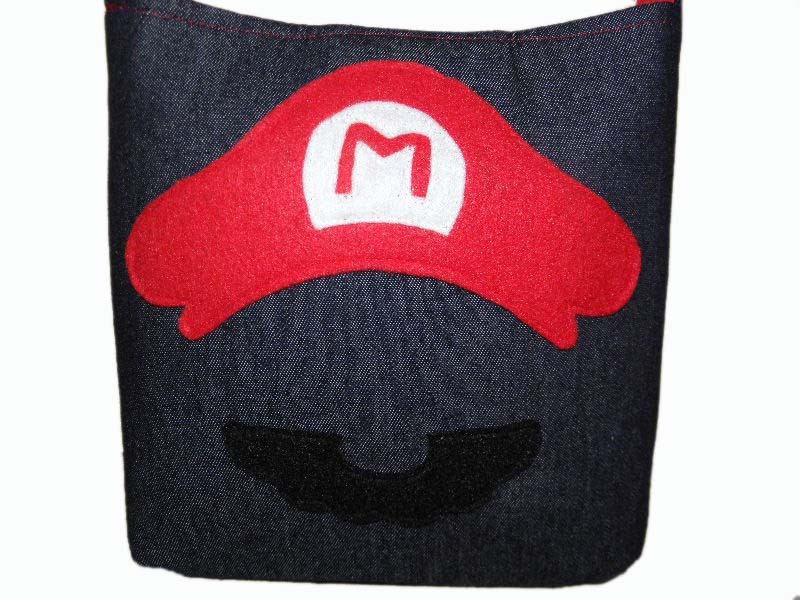 Inside is made of cotton, and has six larger pockets, one smaller pocket, and a pen pocket. 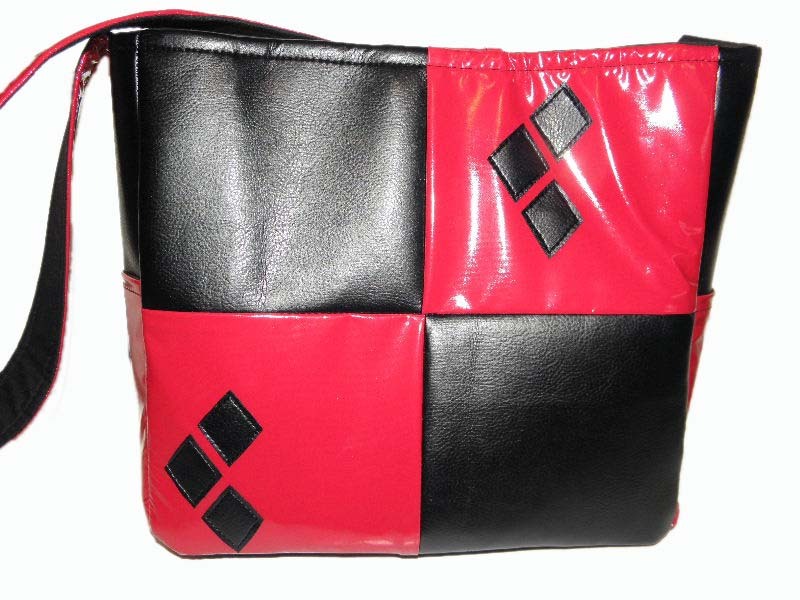 A different twist on the Harley Quinn bag. Same dimensions as the other one, just more plain on the front. A custom order for a long time friend. 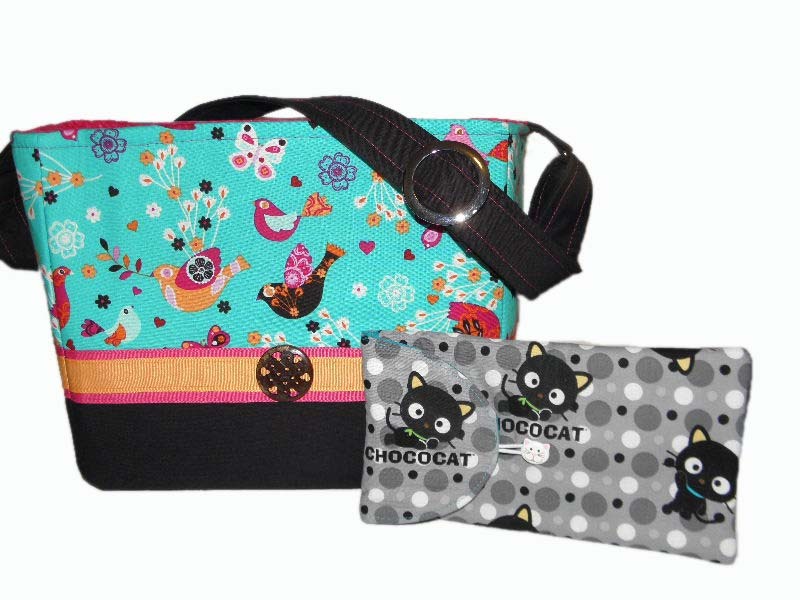 A medium handbag for her daughter and a case for her colored pencils and markers. 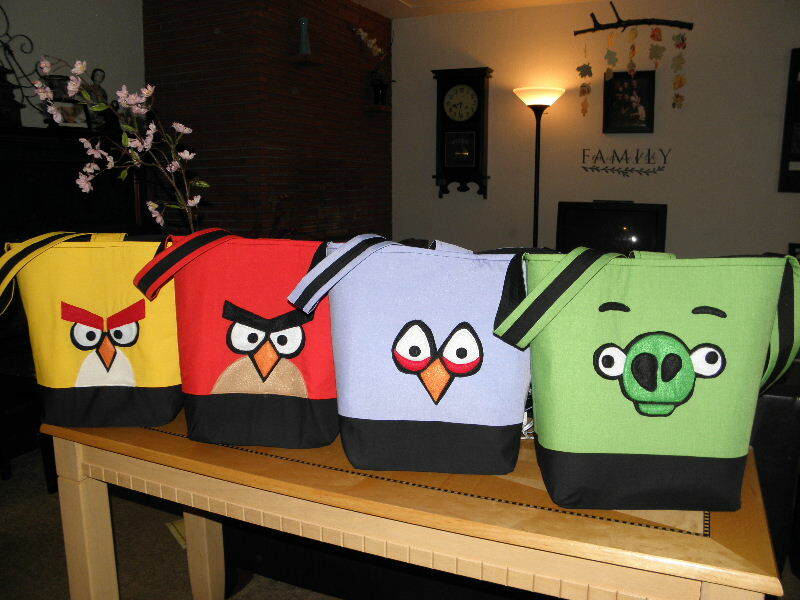 A custom medium handbag. Measures 11" tall x 13" wide x 6" deep. 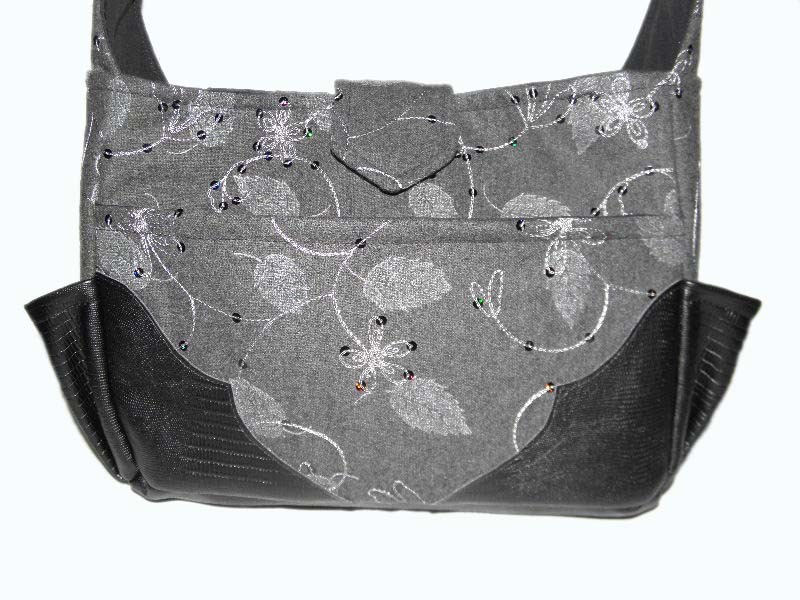 Has a single adjustable messenger strap with a silver slider. 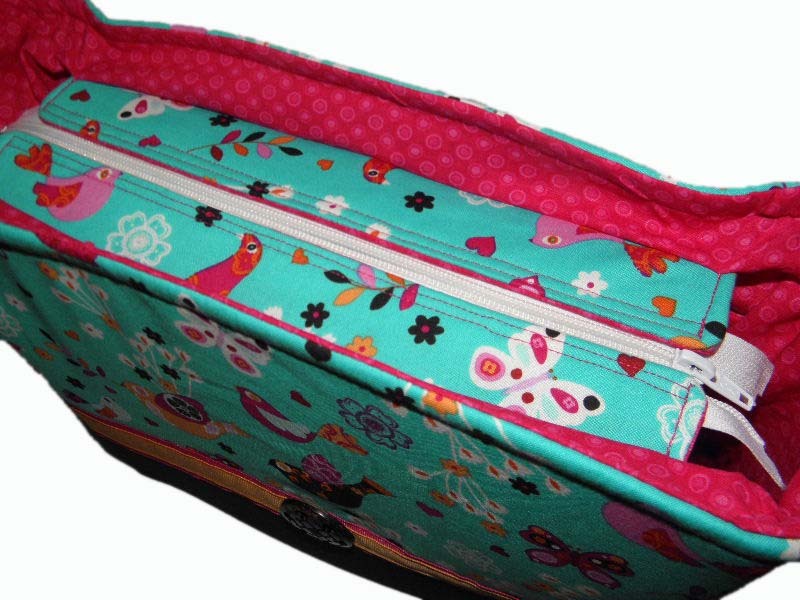 Separating zipper on top for easy access to all her little treasures. Raspberry pink inside, with a single pocket. This will be for an Ipad. 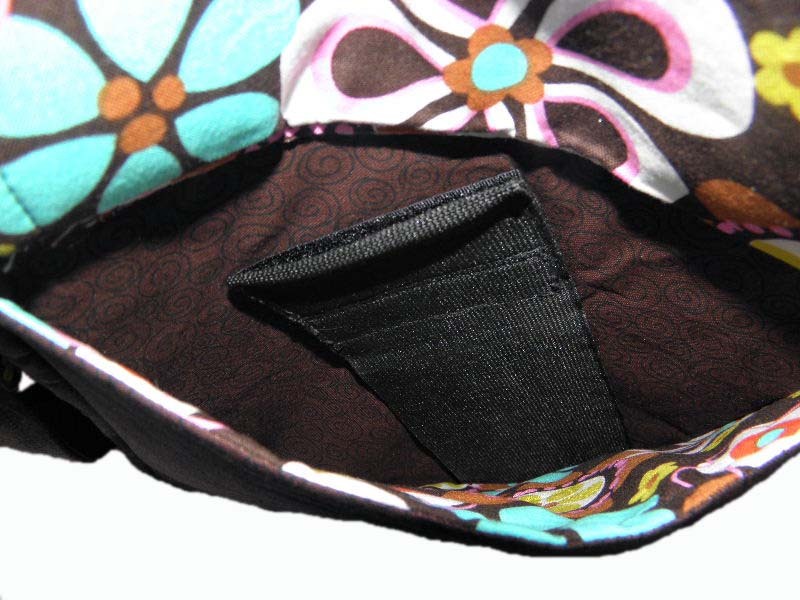 Padded pocket with a bungee/button closure. 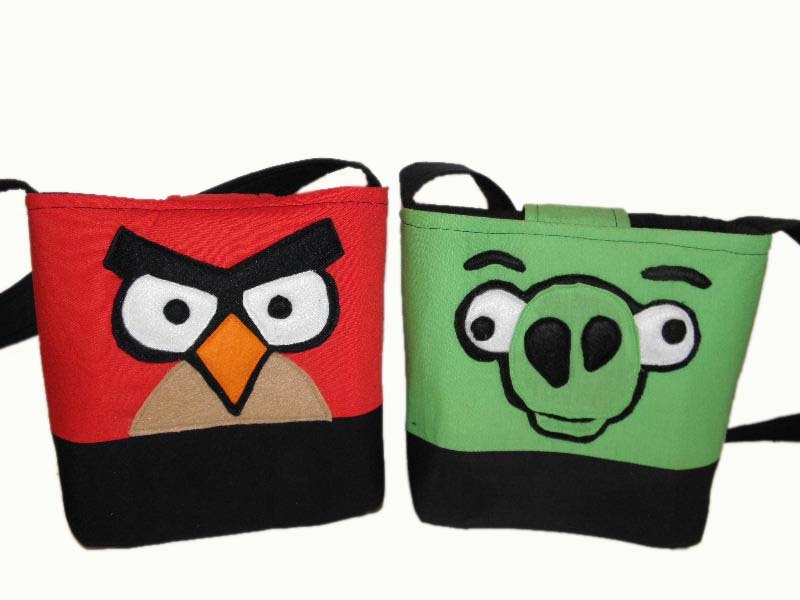 Pencil case is large enough to store several pencils and markers. 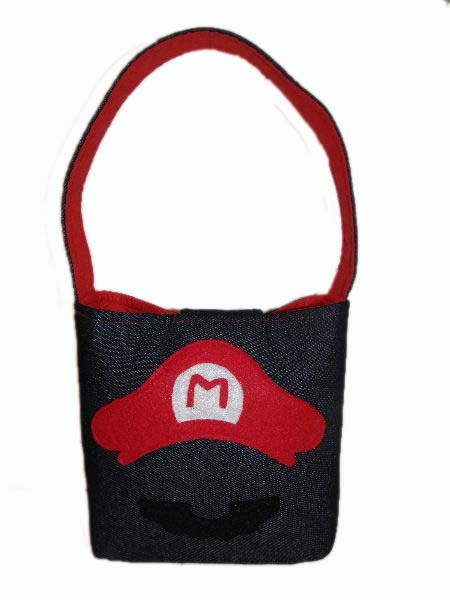 Has a bungee/button closure. 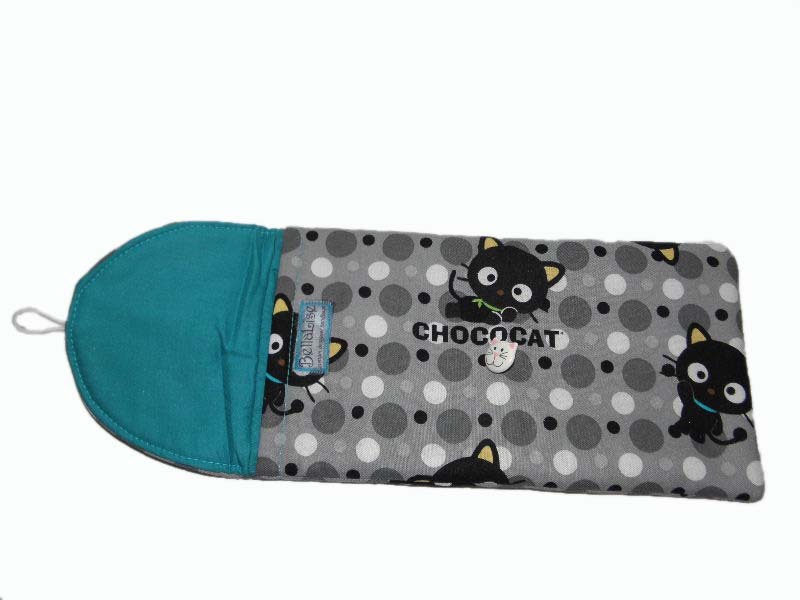 Teal inside matches the Chococat collar in the fabric. 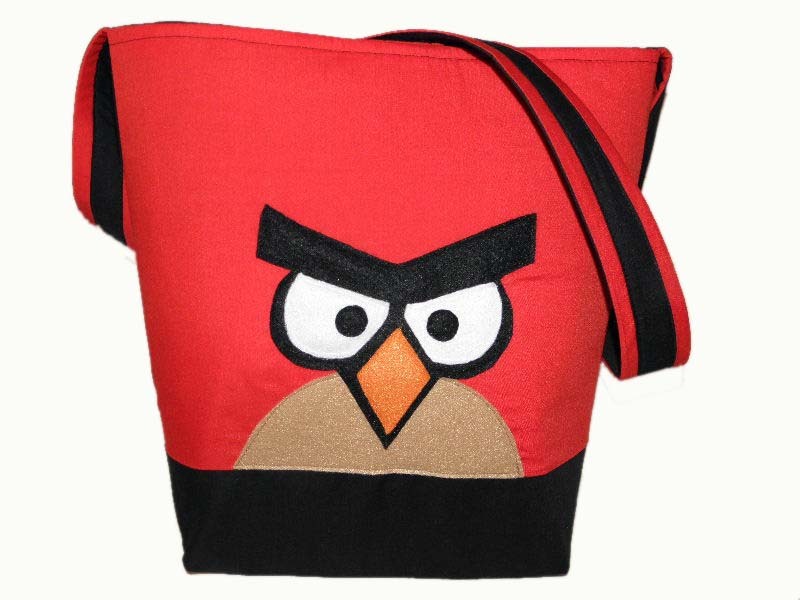 Large red bird tote. Measures 17" x 15" x 6", and has six inside pockets. 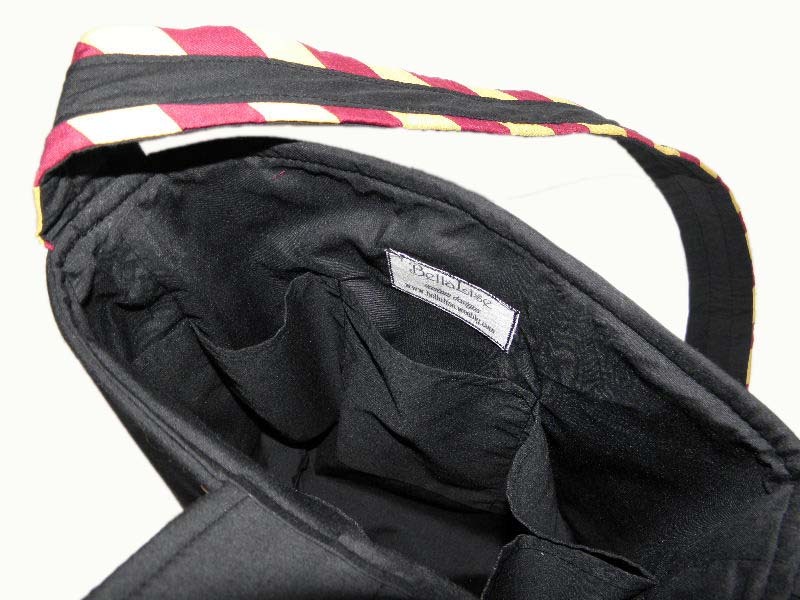 Single strap is long enough to be worn over the shoulder or across the body. Available by special order only. 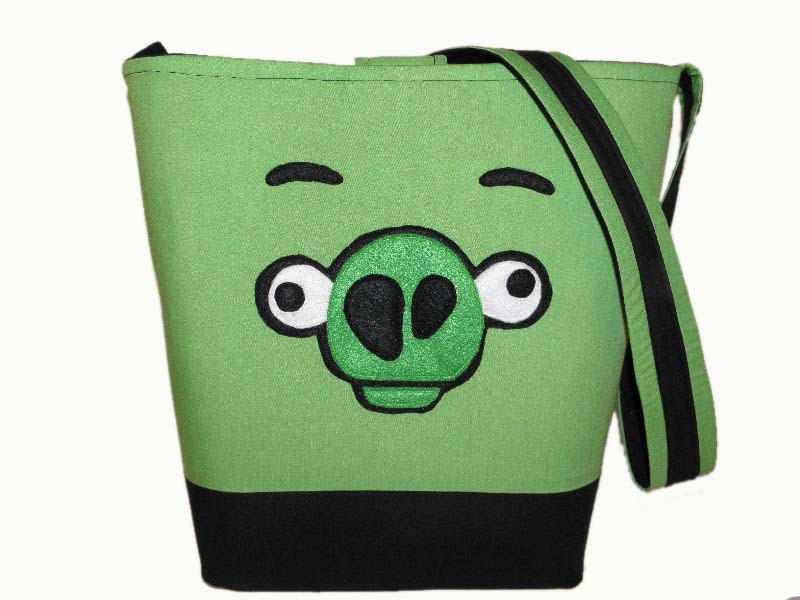 Large green pig tote. 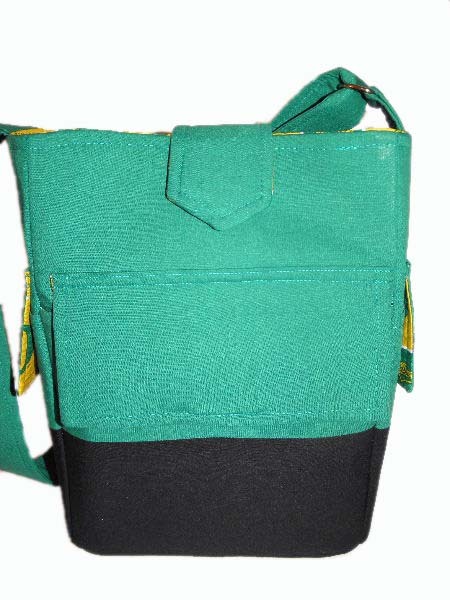 Measures 17" x 15" x 6", and has six inside pockets. Single strap is long enough to be worn over the shoulder or across the body. Available by special order only. 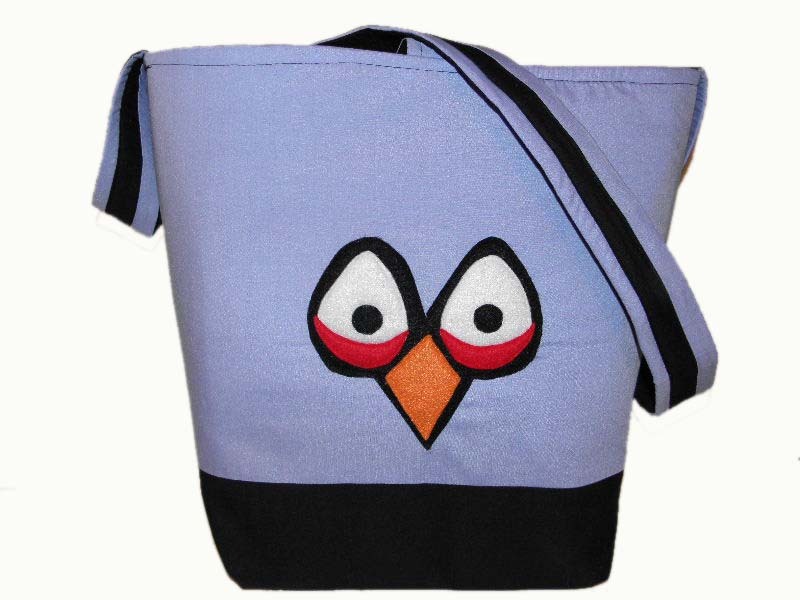 Large blue bird tote. Measures 17" x 15" x 6", and has six inside pockets. Single strap is long enough to be worn over the shoulder or across the body. Available by special order only. 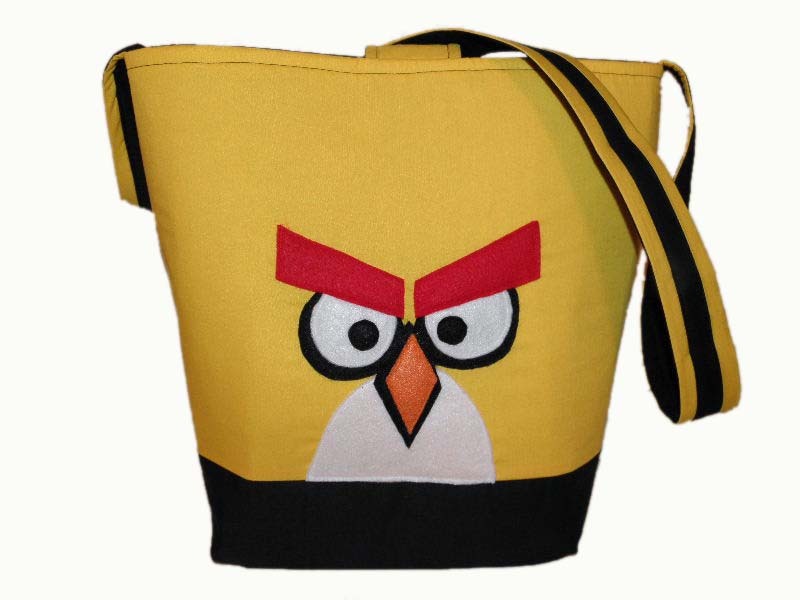 Large yellow bird tote. Measures 17" x 15" x 6", and has six inside pockets. Single strap is long enough to be worn over the shoulder or across the body. Available by special order only. All of the large totes sitting side by side. 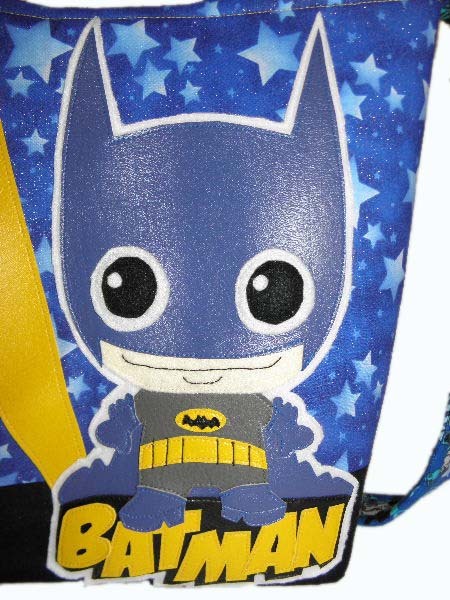 My favorite superhero, shown here as Lil' Adam West, and Batminion. Lil' Adam West available in my Etsy store. 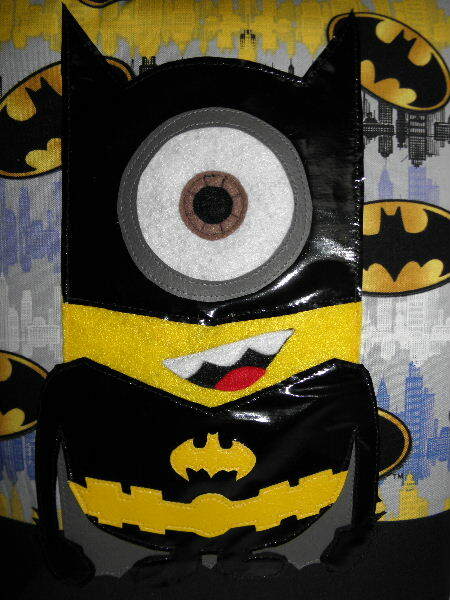 Batminion available by special order only. 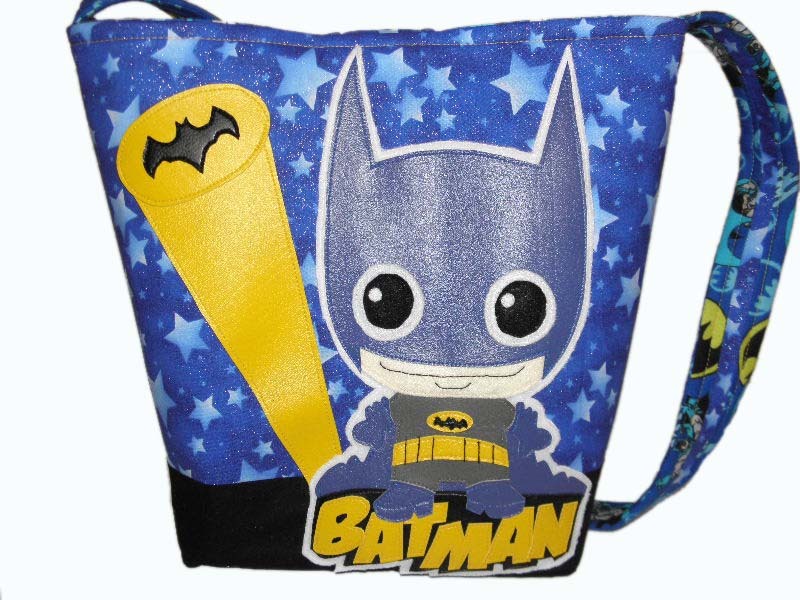 Batman "Lil' Adam" West large tote, available in my Etsy store. 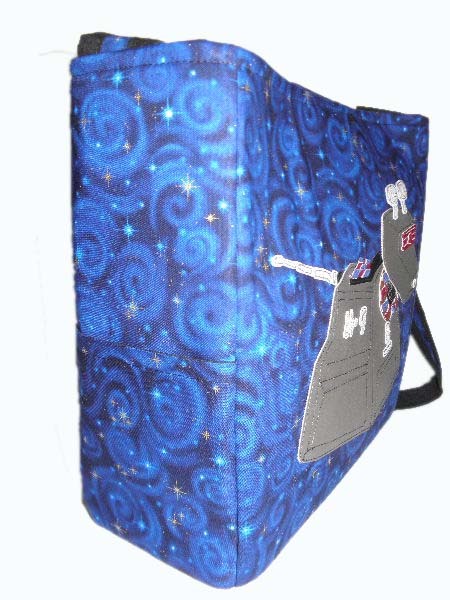 Measures 17" wide x 14" tall x 5" deep, with a single messenger strap, and a hook and loop closure. Front applique is vinyl, and bottom is black Kona cotton. Applique is sewn on piece by piece, some hand stitching, by yours truly. Bat signal shines out from behind Lil' Adam. 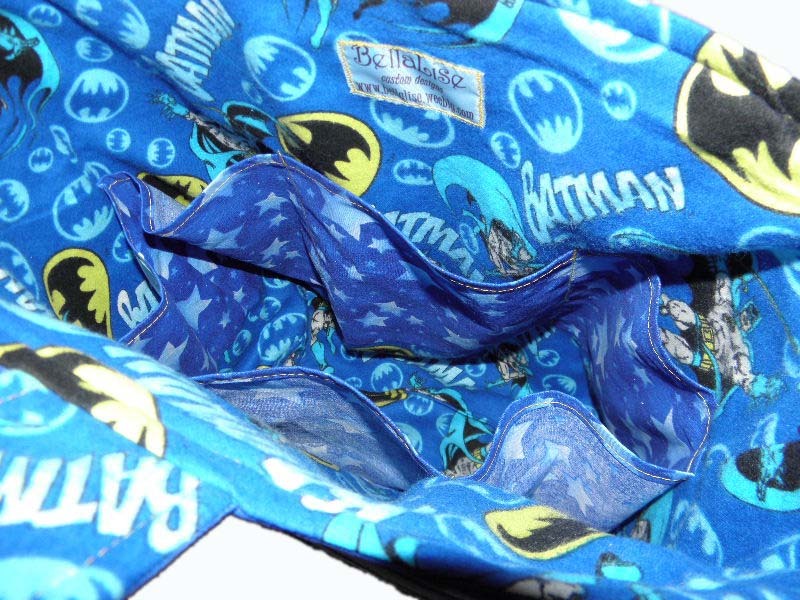 Inside is soft flannel in blue with the Bat logo, and the Adam West comic character. 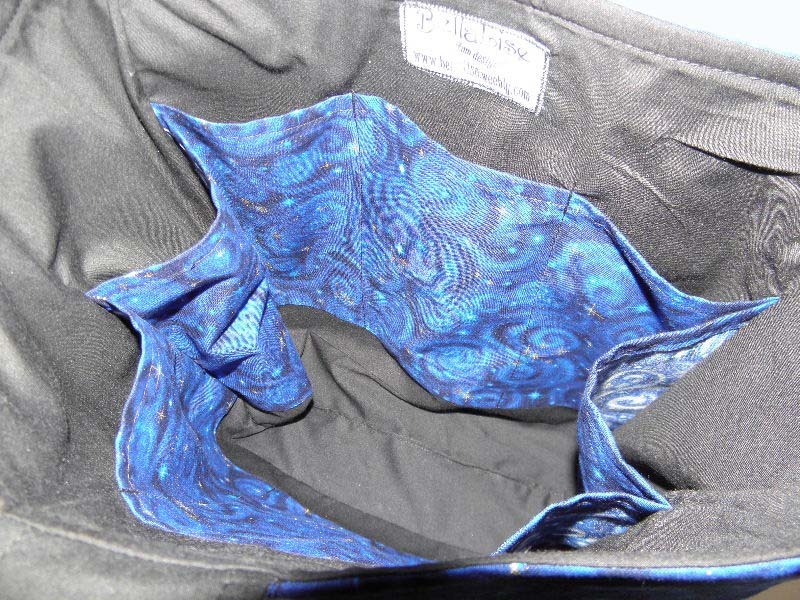 Inside has six pockets. 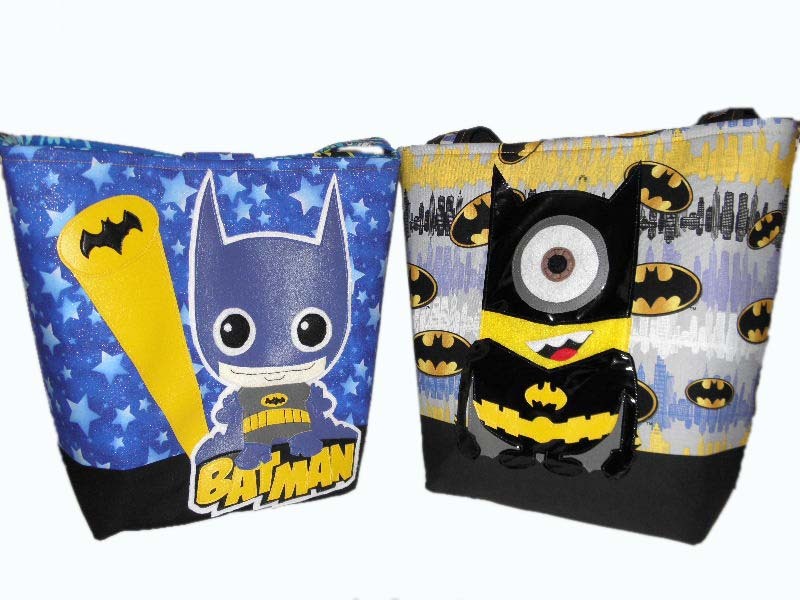 Batminion large tote, available by special order only. Measures 17" tall x 14" wide x 5" deep, has two 28" straps, and a hook and loop closure. 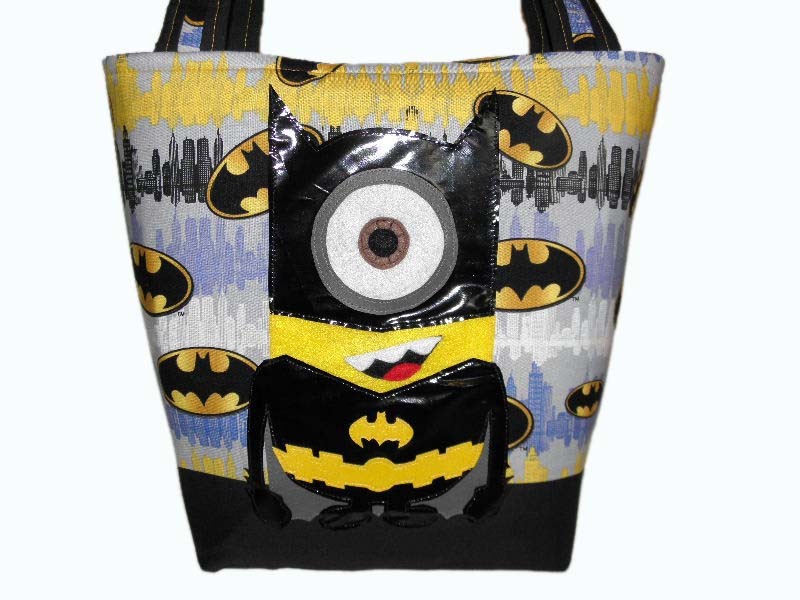 Batminion applique is made of vinyl and felt, sewn onto soft, beautiful cotton fabric. 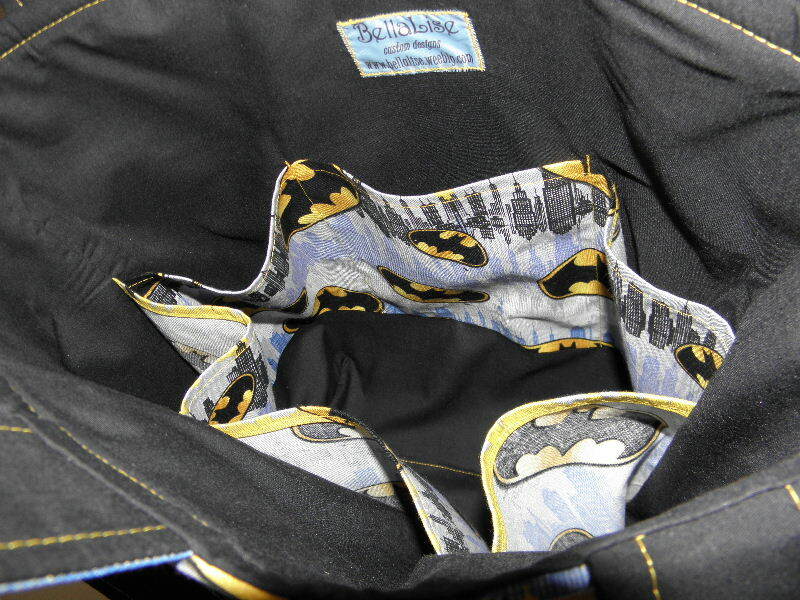 Inside is solid black, with Batman fabric for the six pockets. 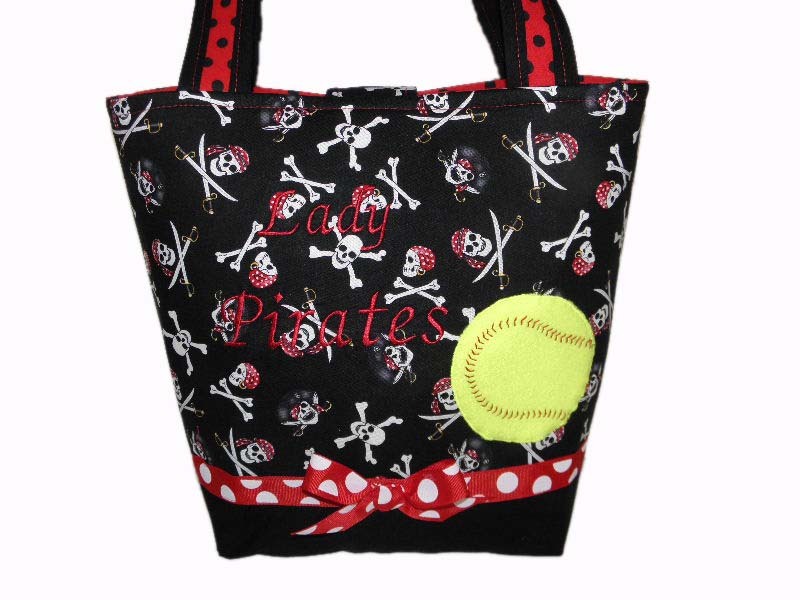 A customized large tote for my daughter's softball team. Script embroidery in crimson. 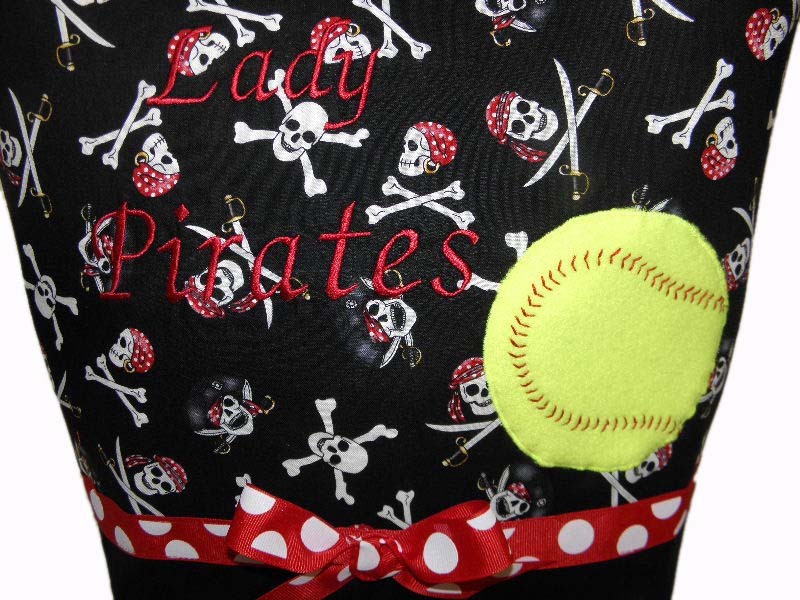 Hand embroidered softball applique. Red with black dots inside. Six pirate pockets. Hook and loop closure. 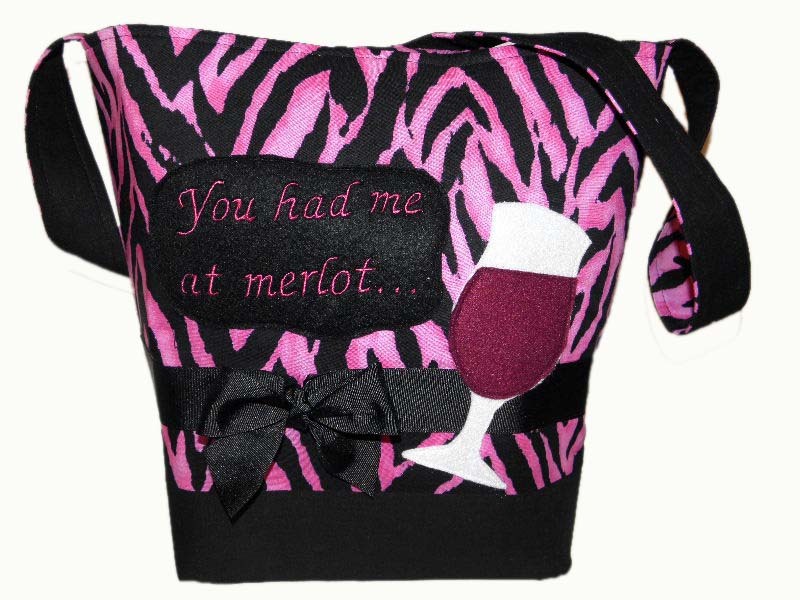 Large wine tote for the wine connoisseur. 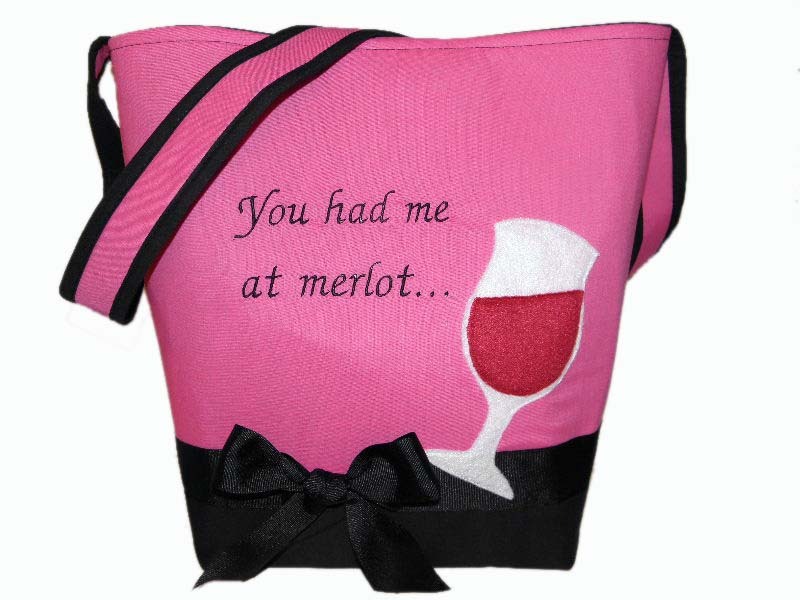 This tote is the perfect thing for storing your wine either from the store, or out at a wine tasting event! 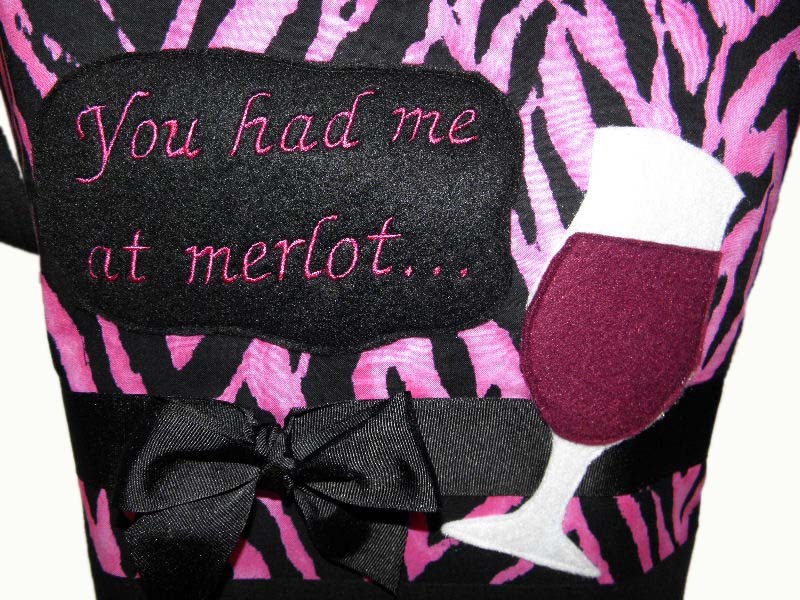 Front embroidery says "You had me at merlot", and applique is fleece and felt. Black bow ties in front. Measures 17 x 14 1/2 x 5. Available in my Etsy store. 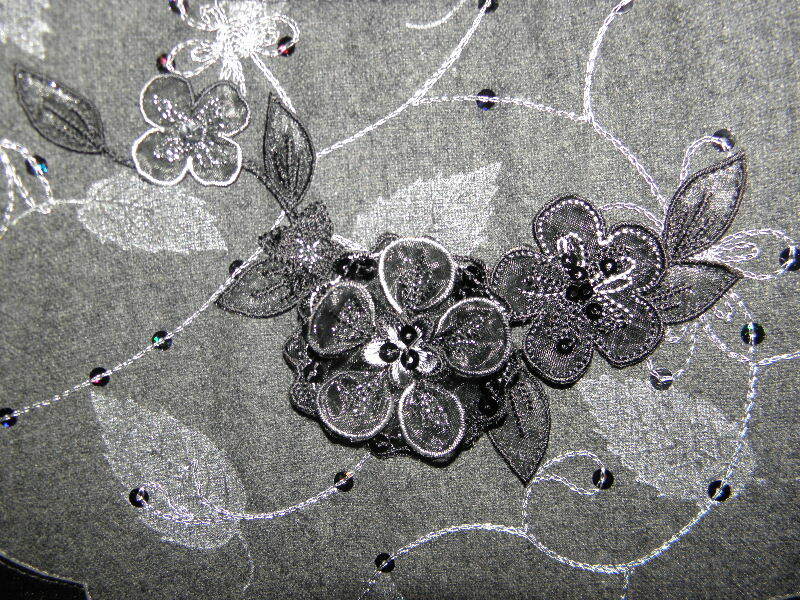 Close up of embroidery and applique. Back has hook and loop closure. Longer messenger strap can be worn across the body to keep your hands free for tasting. Six 750ml bottles nestle comfortably together, with pockets open to the bottom for easy storage. 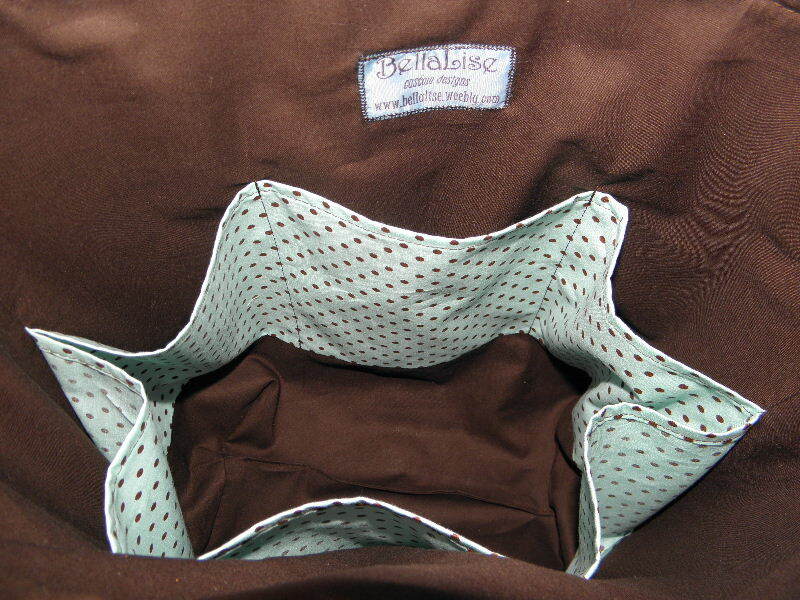 A smaller pocket is stitched to the two center pockets for storing your smaller items. 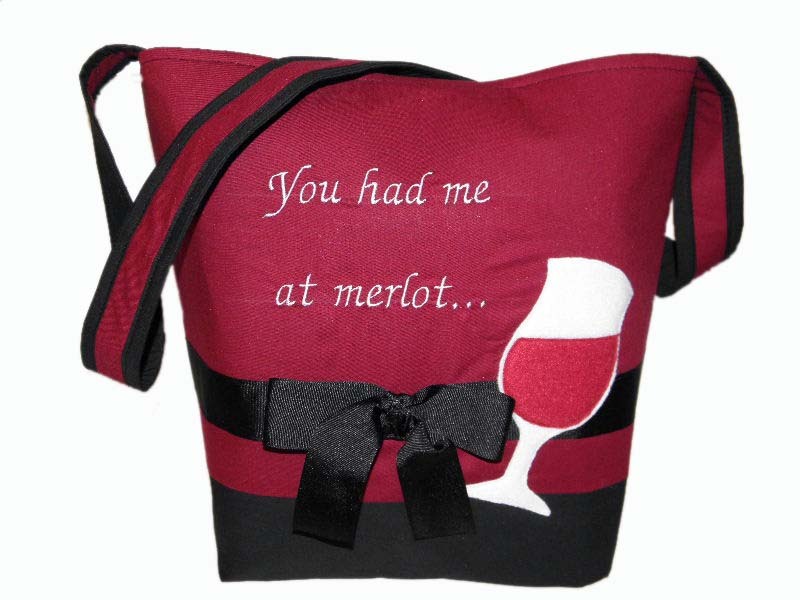 Same large wine tote, this time in burgundy and black, with white embroidery. Still has a single, messenger strap, wine glass, and black ribbon. Available in my Etsy store. 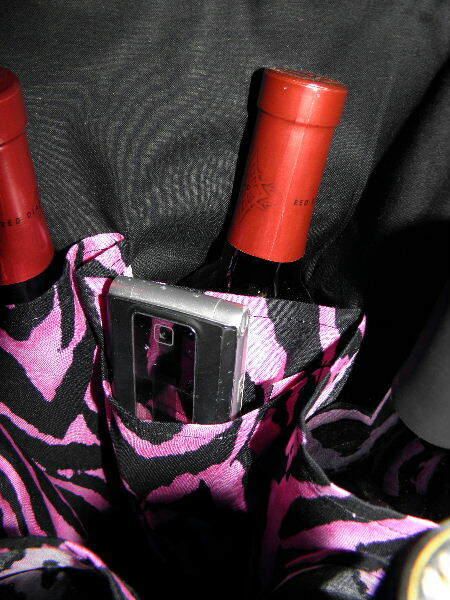 Inside has six padded pockets so that the wine bottles don't clink together in storage. Pockets are open to the bottom so the bottles can settle in to the bottom of the bag. 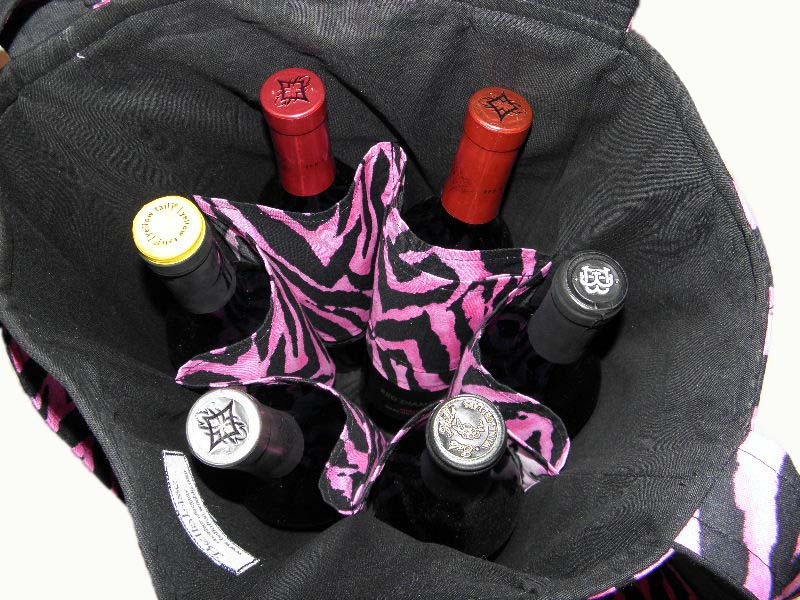 Same large wine tote, this time in hot pink and black, with black embroidery. Still has a single, messenger strap, wine glass, and black ribbon. Available in my Etsy store. 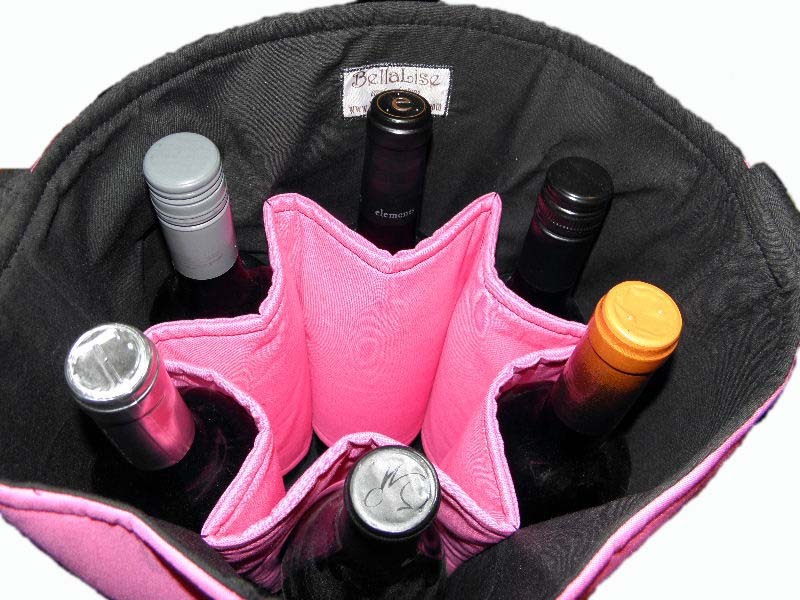 Inside has six padded pockets so that the wine bottles don't clink together in storage. Pockets are open to the bottom so the bottles can settle into the bottom of the bag. 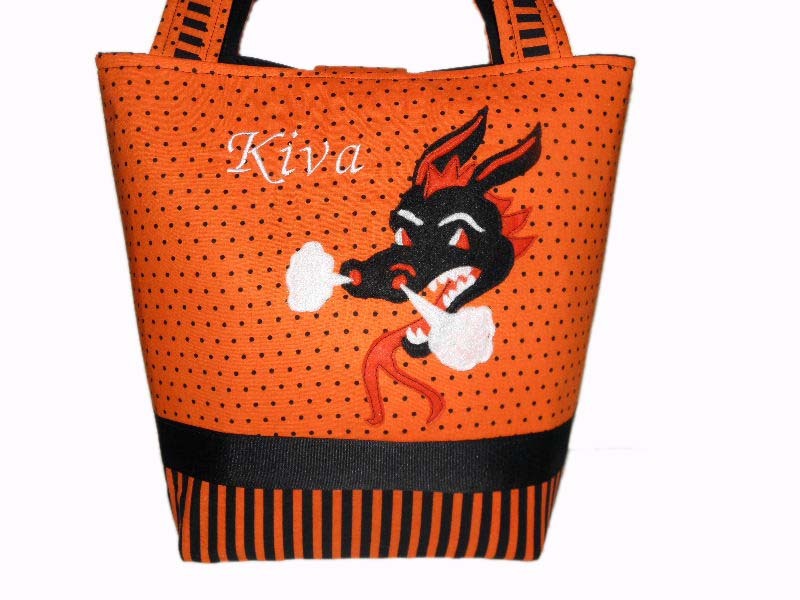 Large tote featuring Dexter the Dragon, of the Dallas Dragons, Oregon. 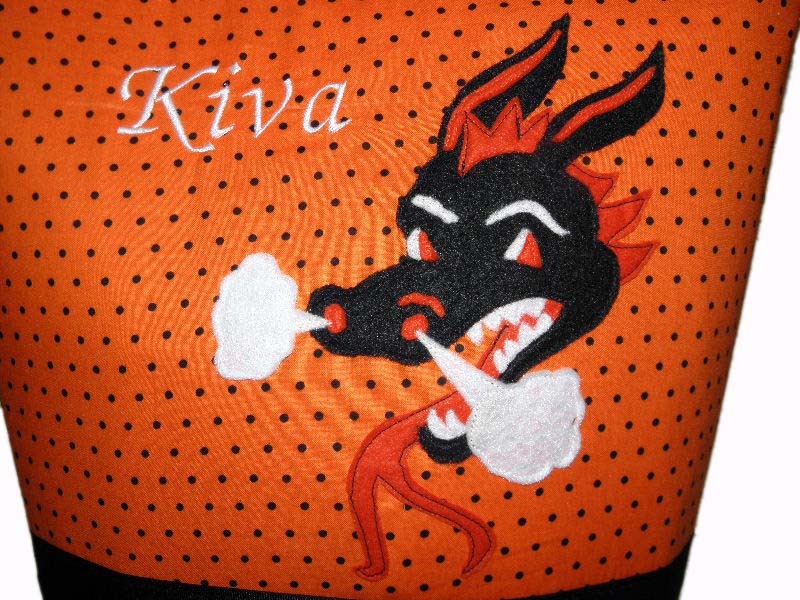 Custom embroidery, hand made applique. Custom name in white, applique of school mascot on the front. Can add any name or mascot. 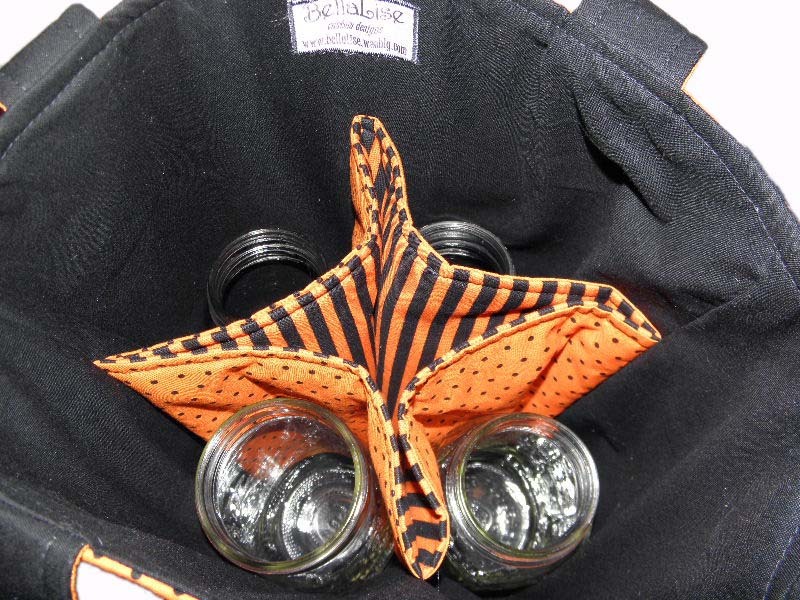 Pockets inside were designed to carry mason jar salads, so they are padded and open to the bottom. Seats four jars total. 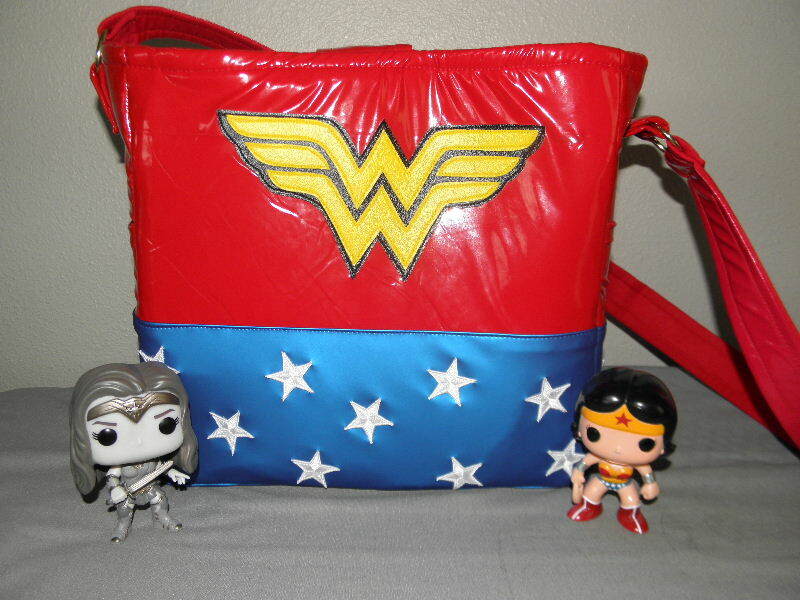 My favorite childhood heroine, Wonder Woman, joins BellaLise in the newest of geek art. 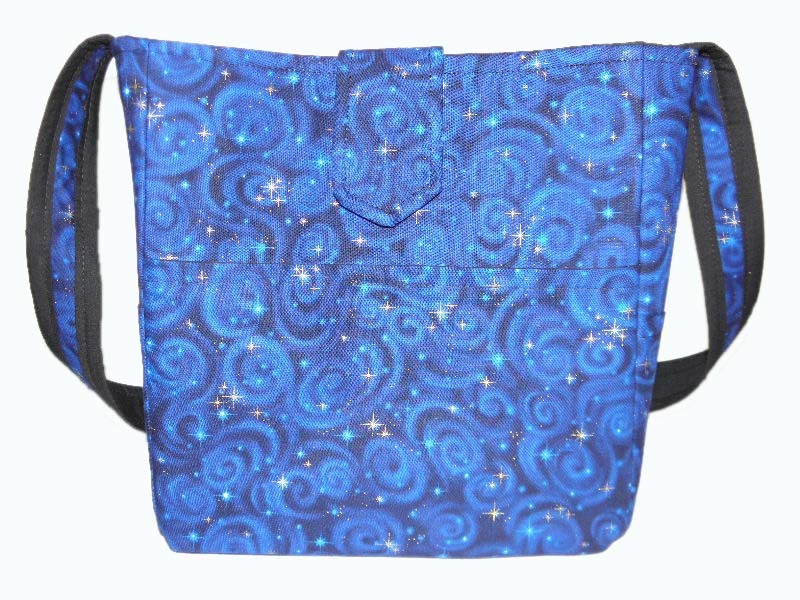 This large tote has felt pieces on the front, six inner pockets, and a single, messenger length strap. Back has hook and loop closure. Measures 17" h x 14 1/2" w x 7" deep. Available in my Etsy store. 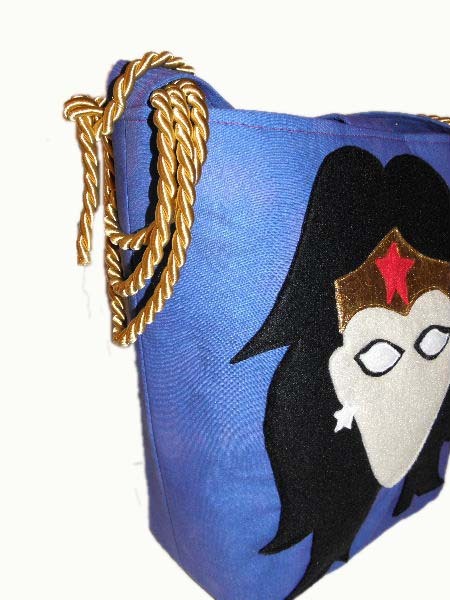 And what would Wonder Woman be without her Lasso of Truth? 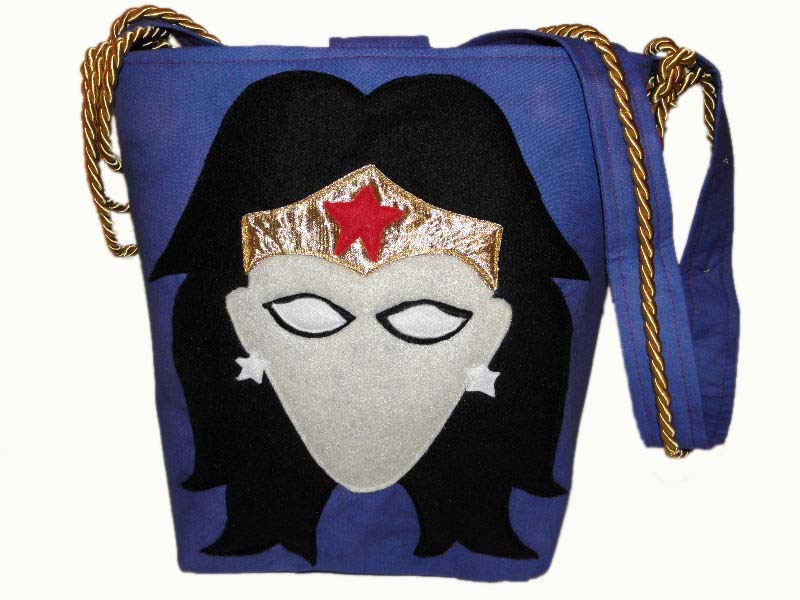 Stitched to the strap, and wound around the side, this lasso really completes the whole look of this adorable bag! 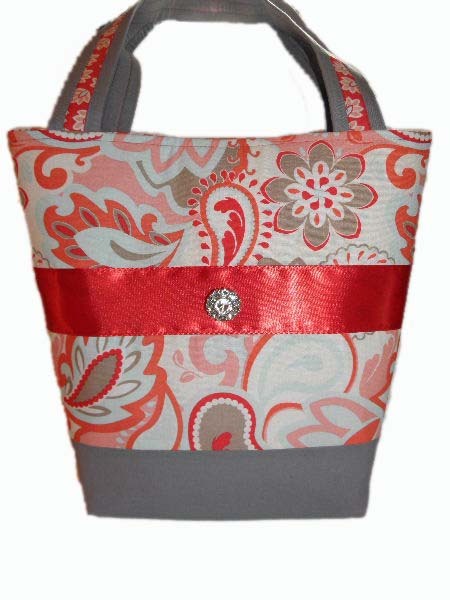 A pretty mix of dressy and casual, this large tote looks great for work or play. 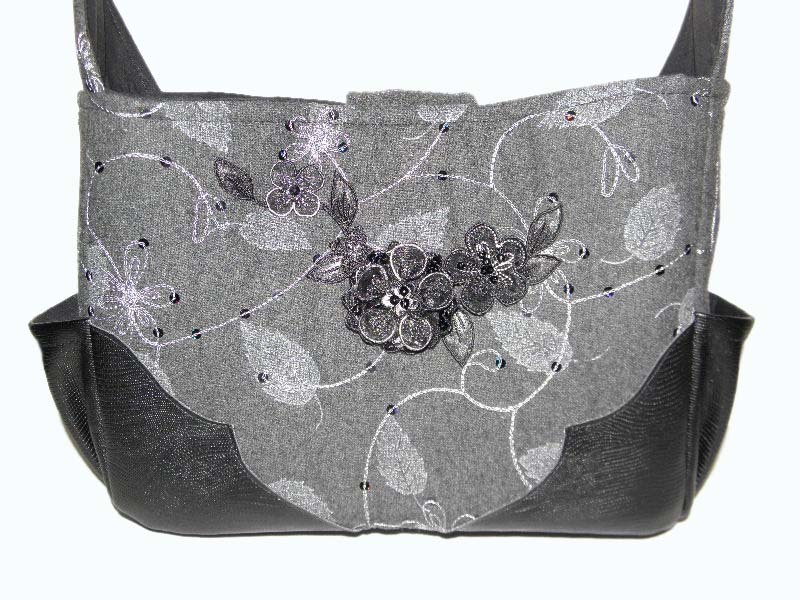 Solid grey on the bottom looks fabulous with the reds, soft blues and pinks, and the flashy jewel button. 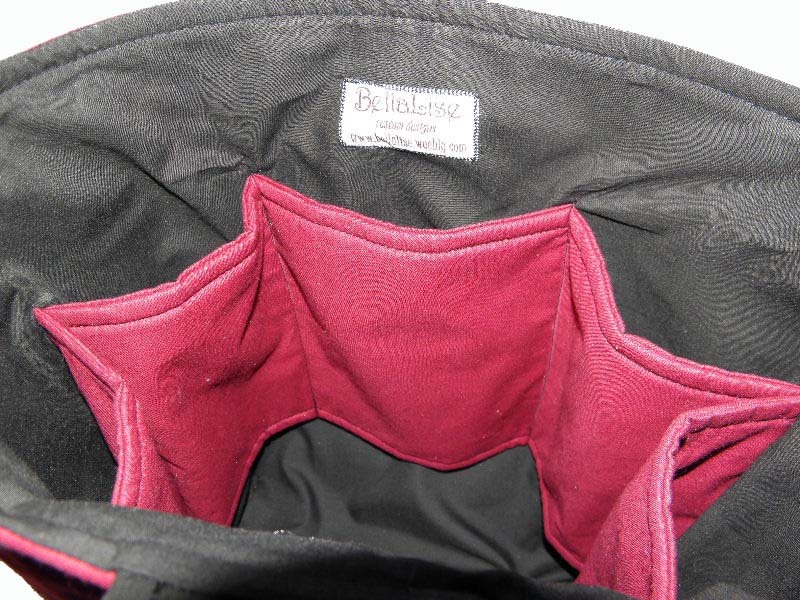 Inside is bright red with six grey pockets. 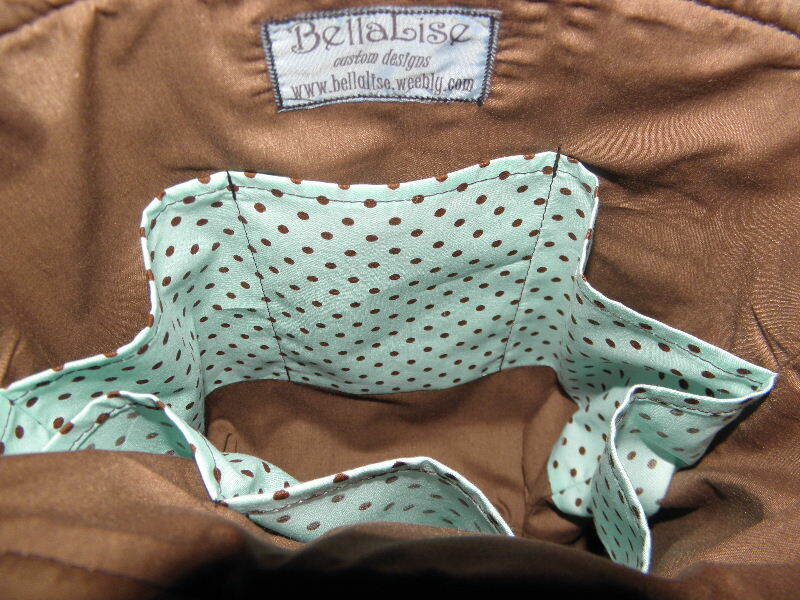 One pocket has hook and loop to keep it closed. 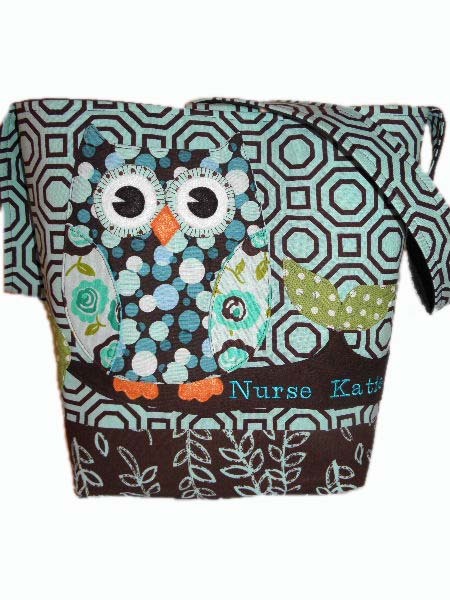 A large tote for a new nurse. Perfect for all those things she will need on her new job! 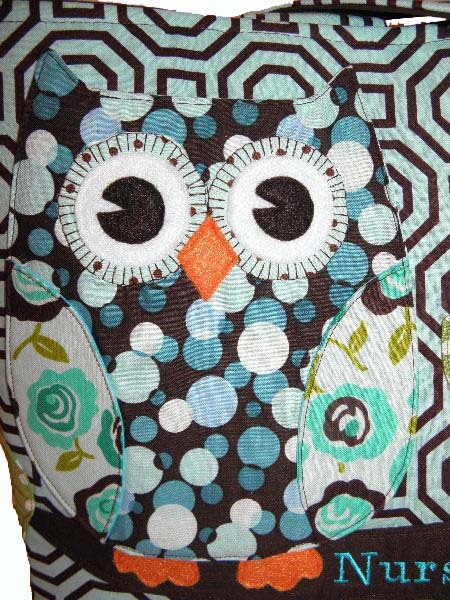 This bag features an owl made of several different blue and brown fabrics. Special embroidery added. Blue and brown owl. I even added a floral with some greens to tie it all together. Personalized embroidery, $5 per line. 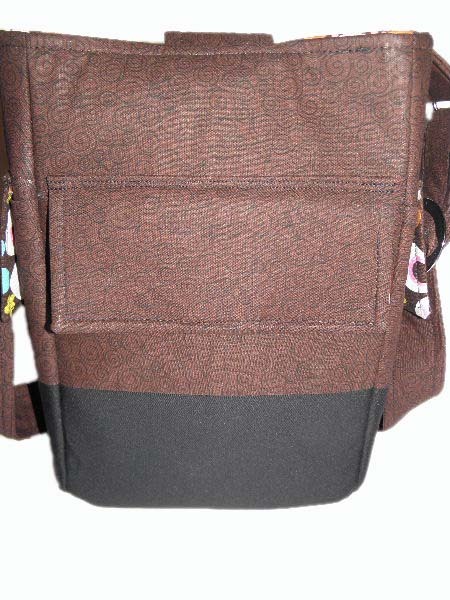 Inside is solid chocolate brown with six polka dot pockets. 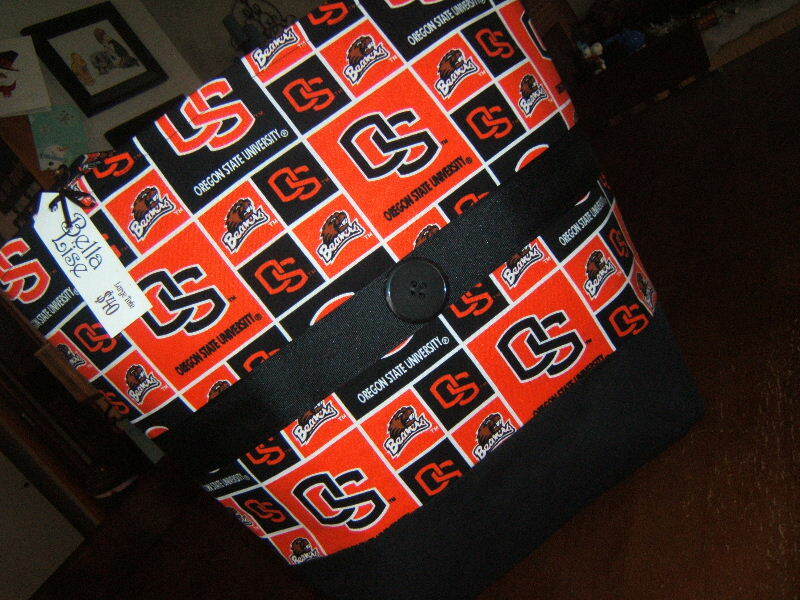 OSU Large Tote - Available in my Etsy store. 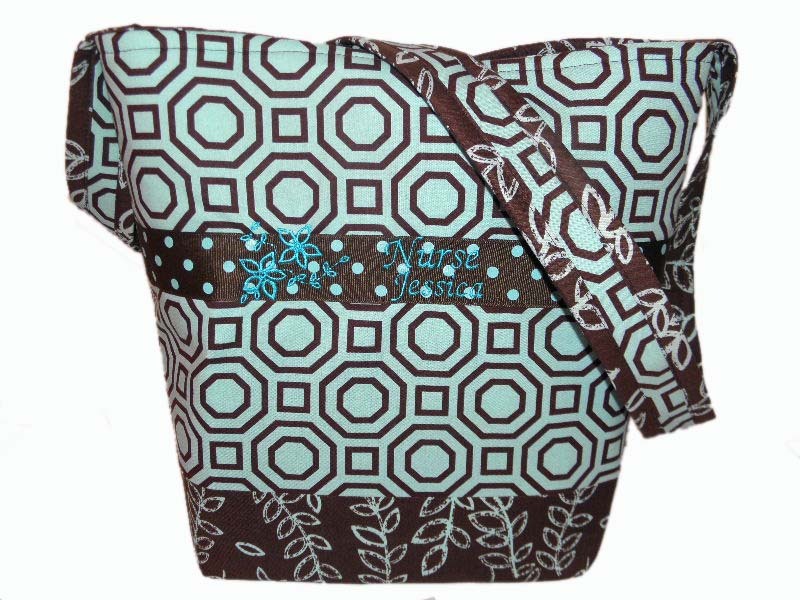 Measures 17 x 14 x 5, reversible. 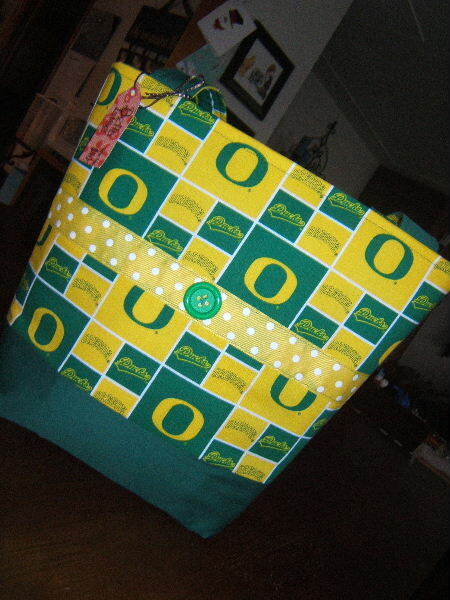 University of Oregon Large Tote - Available in my Etsy store. 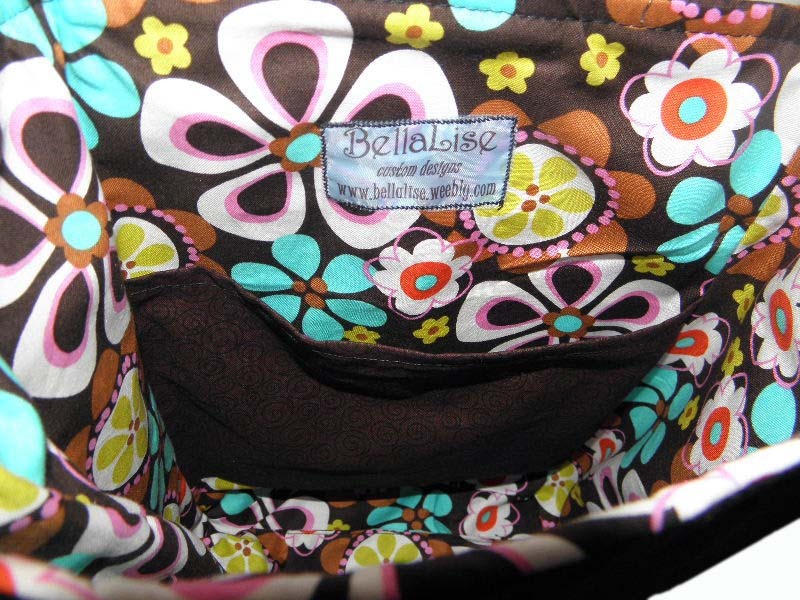 Measures 17 x 14 x 5, reversible. 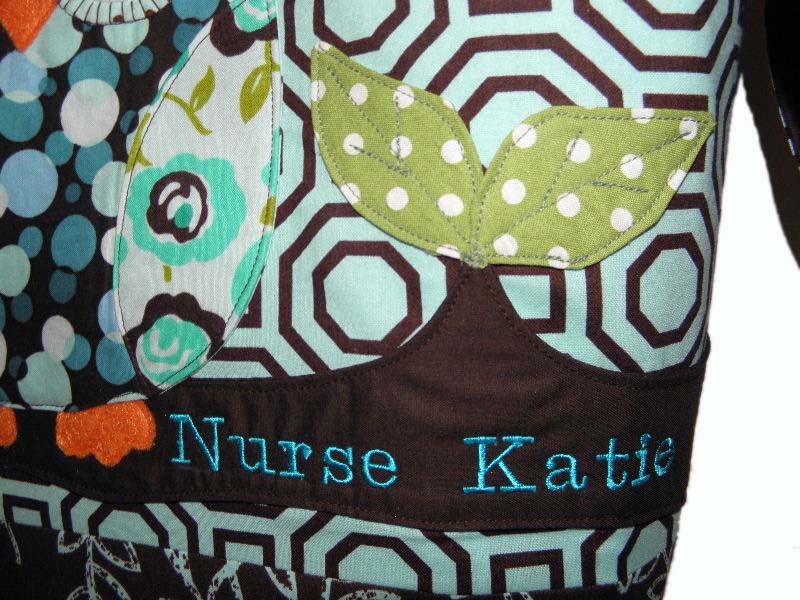 Large tote for a nursing graduate. Flower design and script font in aqua. Inside has six pockets. Messenger strap, hook and loop closure on the outside.